Let Brian Sell Your Property! 834 Acres - $1,480,000 The Stone Mountain Ranch is nestled among some of the most breathtaking scenery in Missouri and offers hunting, development possibilities and valuable water rights. The ranch is comprised of glades, savannas, mountains, pasture land, springs, wooded creek bottoms and forested areas with nice timber. Location is just off Hwy 76 in Branson and next to Table Rock Lake. As they say location, location and location; it doesn't get any better than this. Elevation from 845 feet to 1350 feet making for the most incredible views and boasts over 1/2 mile of Roark Creek frontage and bottomlands with abundant hunting and recreational opportunities. Loaded with wild game including deer, turkeys and fishing in the ponds and creek. Resplendent with its beautiful forest canopy, miles of creeks, imposing ridgelines, meadows and cedar groves, it is impossible to fully convey the grandeur of this property. Stone Mountain Ranch is one of the largest offerings available in the resort area of Branson and Table Rock Lake. The ranch can remain true to its roots and provide a legacy for generations to come or be the next owner's ultimate dream for development. 125 Acres - $350,000 The Greenway Farm is as rare as they come with Million Dollar views, deer and turkey hunting, all with excellent access to the river. The water on this property is second to none with over 1/4 mile of gentle river frontage, ponds, and springs. Conveniently located between Springfield and Branson, the property is situated in a very peaceful and scenic setting. Don't miss the opportunity to own this great South West Missouri property. Call me direct for more information on this great property. Remember, buy land; they're not making it anymore. 42 Acres - $105,000 This ready-to-go hunting property won't be for sale for long. From the sweeping ridge tops to the trophy deer and turkey hunting to established food plots, this is the place for you to enjoy the great Missouri outdoors. The property is ready to go with excellent trails all in place. Imagine sitting in the stand as you see a Missouri monarch stepping out of the brush thicket or a long-bearded tom gobbling in the spring. This is that property! Being located in close proximity to area lakes, fishing, boating and great restaurants are also an option. Call me direct for more information on this great property. 185 Acres - $258,075 Behold, pure beauty. From the moment you park the truck, you know you're on a genuinely unique property. Lace up your boots because you're going to enjoy the walk through this diverse terrain. As you make your way through the tall white oaks you will easily notice the endless wildlife sign and trails along the beautiful ridge. The moment you crest the ridge and catch a glimpse of the postcard type views, you'll have a sudden urge to pull up a seat and simply enjoy what lies before you. The natural beauty of the timbered ridges and the springfed stream will captivate your thoughts for years to come. Property is fenced for livestock. 292 Acres - $394,200 Cattleman's special! This reasonably priced grass and hunting tract won't be for sale for long. From the large bottom ground fields to the gentle ridges and live water, trophy deer and turkeys are just a step away. The property is ready to go with fencing in place and set up for rotational grazing with eight pastures. Don't forget about the hunting, just imagine sitting in the stand as you see a Missouri monarch stepping out of the brush thicket or a long-bearded tom gobbling in the spring. This is that property!! Being located in close proximity from Springfield and area lakes, fishing, boating and great restaurants are also an option. You just don't find many tracts in this location and loaded with wildlife. Property has excellent potential. Farms in this county rarely hit the open market, so don't wait. 193 Acres - $299,150 Diverse property offers many options as a year-round residence, hunting and recreational property or hobby farm that is secluded. Excellent hunting potential. Pockets of thick cedar regeneration within the hardwood timber create distinct bedding areas, and numerous rub-torn trees along the edges highlight the value of thick holding cover. Rockbridge Resort for trout fishing and fine casual dining is just 10 miles away for relaxing and catching the majestic Missouri rainbow trout. Elevated deer stands are in place. The home and outbuildings are situated in a secluded setting. Amazing views from the front porch or fire pit to sit and enjoy all this property has to offer. Most property furnishings convey. With so many options and loads of potential, this property should be on your list to check out! 110 Acres - $148,500 Ready, set, hunt! The hard work is already done on this very nice hunting property and it has all the elements to grow and hold the wildlife you dream about. Food, water and shelter. Excellent trail system, food plots, mature timber, pockets of brushy thickets, pinch points, draws and the list goes on. Perfect flat area off the road for building your dream home or hunting camp and electric is only a few feet away if roughing it isn't your style. Want to do more than hunt? The fishing in this area is top notch. High Prairie Farm is a highly productive ranch in an excellent location. It is a top-shelf cattle ground property that has been well managed and improved. Property is currently under a custom farming practice with a crop rotation of corn and rye providing excellent silage for their cattle program. The farm is currently running 368 yearlings and 146 mother cows. Excellent road frontage makes shipping and working the farm easy. A rare farm offering in the most desirable part of Southwest Missouri, so don't let this legacy property slip by. Please read detailed bullet points attached on farm particulars. Conveyed with all mineral rights owned and hunting rights. Located in a great whitetail hunting area. Call me direct to see this high production property. PRICE REDUCED!! Smith Creek Ranch is a full-time operator's or gentleman's cattle operation. From the magnificent ridge top views overlooking the cattle as they graze to the hayfields and over 350 acres of pasture ground, this ranch reflects the American dream of land ownership. The property is set up for rotational grazing with seven pastures and all have live water or automatic waters. The well-built three bedroom home can be a permanent residence or just a weekend getaway. The home was designed with simplicity and efficient furnishings to finish off this dream property. Call to schedule your private showing. Remember, buy land; they're not making it anymore. PRICE REDUCED!! The Double Ridge farm is made up of large wooded draws and open pasture areas with live water, a pond and springs. Property is fenced for cattle and lies just 10 minutes from Branson on a well-maintained blacktop road. Morel mushrooms are plentiful throughout the property in the spring. Double Ridge farm is surrounded by timber tracts making the deer and turkey hunting top shelf. Whether you are looking for an incredible hunting retreat, cattle property or a beautiful home site in the country, this place has it all, and the price is reasonable. Great place to build your home, raise your family or just retire. Call me today to schedule your very own private showing. Don't miss the opportunity to own this great Southwest Missouri property. Blue Water Ranch is located in South Central Missouri and is surrounded by large timber and pasture tracts. In a very secluded area with views that are absolutely stunning. Wildlife is abundant providing great deer and turkey hunting, including numerous whitetail scoring over 150" being harvested. Gentle rolling terrain with approx. 300 acres of cattle pasture, hay ground and awesome river bottom along the Niangua River. Remainder of the property is in mature hardwoods and trails. Water on the property consists of a large natural spring, spring branch, river and ponds, two of which are spring fed, and automatic waterers that are hooked up to the water well for livestock. Fenced and cross fenced with steel posts and barbed wire. Good set of corrals and loading area. On a blacktop road. The main barn is 40' x 40', plus there is a smaller barn that is 20' x 40'. This ranch has the potential as a cattle ranch, hunting ranch or river retreat. 408 Acres - $938,400 Three Bar Farm is truly the property of a lifetime, offering beauty and seclusion as well as a solid financial opportunity as a owner/operator, cash rent and land appreciation on pasture/bottom ground properties. It is located approximately 16 miles east of Marshfield in Southwest Missouri. The property consists of slightly rolling hillside with level creek bottoms. Approximately 85% of the land is open with a quality stand of fescue and native clovers. The farm has good fencing and cross-fencing, two corrals, working facilities, scales. The live water creek runs along the entire property with approximately 3/4 mile of frontage and several holes where fish are found. Wildlife is abundant at the farm where the giant whitetail deer never have to leave the property with the bedding thickets, ridge tops and bottoms giving them amazing habitat. It is very rare to find a property that has this much huntability that only Mother Nature could create. Give me a call to set up a private showing of this dream property. Vista Ranch is a full-time operator's or gentleman's cattle operation surrounded by national forest. From the magnificent ridge top views overlooking the cattle as they graze to the hayfields and over 1/2 mile of creek frontage, this ranch reflects the American dream of land ownership. The property is set up for rotational grazing with six pastures. The well built three-bedroom home can be a permanent residence or a weekend getaway. The home was designed with simplicity and efficient furnishings to finish off this dream property. Hunting is outstanding with many 140-160 inch bucks harvested. This is a top shelf property. Call to schedule your private showing. Remember, buy land; they're not making it anymore. 313 Acres - $1,095,500 Beautiful farm located just west of Springfield. Very diverse, and properties in this location do not come up for sale very often! Made up of open land that consists of hay production and pasture, and there is a beautiful bottom field along the creek that could be utilized for row crop production for corn, beans or alfalfa. Along with the farming and cattle opportunities this farm provides, the balance of the farm is in timber, providing excellent hunting for whitetails, turkeys and other wildlife. Huntability and quality of deer on this property is second to none. Farm has over 1 mile of blacktop frontage, plenty of locations to build, and very scenic views! This farm has it all! Legacy Grass and Hay Farm With Good Access And Good Location. This large, high ground tract offers endless possibilities for the new owner. Good cattle farm, entertainment and hunting destination, high-end development opportunity, or one of the best grass producing farms around with fantastic hunting just to name a few. With this farm being owned by the same family for over 100 years, the current owners are parting with massive intangibles as well as premium timber and grassland. A new survey has been completed. Call today for your private tour of this special century-old farm. Retirement Housing Specialists For 30+ Years! We can further assist you to evaluate and give you more information about listing your current home and making that move. NOW IS CERTAINLY THE TIME!!! Enjoy vacation time, family time, hobbies, etc. and don’t worry about maintaining your current home. Country Living . . .
New S/D N Choose ow Open. Your Ow 2 to 5 A n cre Lot . Wonderful Front Porch Overlooking Ozark Mountains! Exquisite Landscaping! 2,160 sq. ft home with spacious open floor plan, family room with fireplace, 3BR, 2BA & 3-car garage. 10x30 screened in patio. Brand new wood flooring in the morning, dining & family rooms. New tile in the BAs, utility & kitchen. All this on over 2 acres. $249,900. Offering Quality Homes, Building Lots & Acreage from 2 to 5+ Acres - Starting at $19,900! Spacious Lots Available for Purchase. Exclusive Subdivision, Close to Lake or Place Your Home on Your Lot or Land! 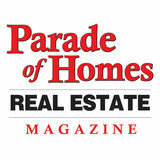 Parade of Homes Real Estate Magazine Robin Christian - Publisher 417-334-6671 Ginger Michaud - Office Manager 8796 State Hwy. 165, Hollister, MO 65672 parade@parade-homes.com Gena Farmer - Designer For Subscription Information, Please Call 417-334-6671 Or Send $20 For A Year Subscription To: 8796 State Hwy. 165, Hollister, MO 65672. Neither Publisher nor listing Broker are responsible for accuracy, misrepresentation or typographical errors, or page placement herein contained. No part of this magazine may be reproduced or republished without written consent of the Publisher. Carol Jones, REALTORS is now ReeceNichols Real Estate. Same Experts, New Look. Great home in StoneBridge on a nice sized lot, with privacy. This very well built, one owner home, with neutral colors and great finishes is priced right. The cathedral ceiling and floor to ceiling stone fireplace in the Great Room is very appealing. The nice sized master suite with walk-in is a real plus. Everything you need is on the main level, plus 3 additional bedrooms and 2 baths for your guests use, all is good. 25 SOUTH CAPPS COVE - This 4,400 sq. ft. home is so close to the water, you will be amazed at the ease of access and the beautiful Table Rock Lake Views. The home has 4BRs, could be 5, and 3BAs. Seeing is believing, Google it to confirm the perfect location. Call for Pricing and additional information. #60106690. Recently updated home on 3.27 acres close to Table Rock Lake. 3rd party boat slip available. Home features include Large eat in kitchen, 3BR, 2BA, 1,600 sq. ft. plus a huge screened-in porch, detached oversized 2-car garage, small barn for animals. Property backs up to 420 Acres of Forest Land. Call today for a showing. #60121362. 1608 Bellefonte Road, 8226 North Hunter Drive, Harrison. Beautifully Harrison. Single Family landscaped, custom built Home for sale with 4BRs & home located on 10.92 3.5BAs. This 4,200 square acres. Porches & stunning foot home was built on a Acre lot. Open floor views, 3,600 sq. ft. multi-purpose building, as well as 10.33 plan, wrap around porch, huge deck, theatre room, a barn & equiptment shed. #138436. $460,000. cookâ&#x20AC;&#x2122;s dream kitchen. #138870. $380,000. Major price reduction! 1+ miles of Gasconade River Frontage (1/2 mile both sides), springs, year round creek, 364+ acres of excellent grass, hay fields, & tillable bottom ground makes up this highly productive livestock farm/hunting property. A farm/livestock operation of this caliber with so much to offer rarely ever comes on the market. Well maintained older 4BR, 3BA. 2 fireplaces & new outside wood furnace. There are multiple barns (8), of which one is an older milk parlor - non-operational at this time. 2 wells & automatic freeze-proof waters. Located only 45 miles East of Springfield on 4-Lane Hwy. 60 to 1st Mansfield exit, then North 4 miles to farm. Opportunity knocks sometimes only once - this is your knock! MLS#60115449. “PRICE REDUCED” development 240 acres surveyed into small buildable tracts. Hunting retreat (lots of wildlife), recreational (build your dream home overlooking your lake & enjoy!!) Then sell surveyed tracts off to finance your retirement/investment. Good roads thru surveyed acreage, only 1+ miles from Hwy. 60 (4-Lane Hwy.). A tract of land this large, surveyed in small acreages rarely ever comes on the market! Owner may divide & sell 160 acres or 80 acres. This property is priced to sell! MLS#60128270. 80 Acres, location, location! 1/4 Mile off of Hwy. 60, 50 miles to Springfield, 3 miles to Mansfield, 11 miles to Mountain Grove. Well maintained 3BR, 1-1/2BAs, 1,432 sq. ft. brick/vinyl home nestled under the trees. Full basement (partially finished), with a John Deere room. Live water, 1 spring. 60 acres in grass, pasture/hay ground. This is your farm if you are looking for an excellent 80 acres with a lovely home. Call now! Don’t miss out on this one! MLS#60059808. What a great weekend retreat in the woods, or permanent residence if you love privacy & Seclusion! Winter view of the North Fork River, walk to the river. Be sure to bring your canoes. Would be a great spot for a corporate retreat or a large family! Could easily sleep 15+. Property sells fully furnished - down to the sheets & spoons. Very unique property - only one like it! Call Paul 417-839-5096 or Wes 417-823-2300 for your private showing. MLS#60109625. Owner Finance Possible to QUALIFIED Buyers With Minimum of Monday-Saturday 9am-7pm 25% Down! 1033 W. Main, Branson Open 9am to 7pm condokingshawn@gmail.com EZ 2 Show! LOCATION HERE! This property is 1.23 acres on expanding & busy Shepherd of the Hills Expressway. Just down from Shoji Theater. Water park is going in just down the road. This property will not last long as it is a developer’s dream! Doublewide & garage on the property. Value is in the land. Utilities in place. MLS#60125599. $169,900. TANEYCOMO MARKET! Gas Station, Bar/Restaurant, Campground, Boat Rental/ Marina. In downtown Rockaway Beach on the waterfront. Was a very busy business here. Boat Dock + Gas Pump not operating at this moment. Qualified/serious buyers only please! MLS#60066194. $265,000. 1. 37.5 ACRES ON T HWY., NEXT TO THE HIGHLANDS. Platted. 2. 53 ACRES ON BUCHANNAN ROAD! 3. SEVERAL LOTS FROM $14,000. 4. HOLLISTER; BY THE CITY HALL. BUSINESS 65 & ESPLANADE. 5. 1.8 ACRES ON GILLIAM. $15,000. LOCATION, LOCATION!! Corner on Roark Valley & Bus. 76. Everyone drives by this location! 1,200 sq. ft. m/l. Front building includes 4 offices + front secretary room & full kitchen. 14 units in the back including laundry. All rooms individually metered for electric, making it ready for offices or apartment rental. Double decker billboard included! MLS#60033881. 9. LUXURY 3BR, 3 full BA at the Legacy Thousand Hills! Walk-in level. Golf Course Views. 1-car garage, MLS#60130545. $249,000. Plantation-Style Estate On 5 Acres! Gated Subdivision. 4 bedrooms, 3 1/2 bath, 3-car detached garage, Chef â&#x20AC;&#x2122;s Dream Kitchen with Carthage Marble countertops, historic wood floors milled by Amish, St. Louis brick floors, library with gas fireplace, hearth room, screened-in porch, family room with pottery studio, apartment with living room and bedroom, large covered porch, gorgeous landscaping and so much more! Private setting on 5 acres! Also available as house and 15 acres. LOG CABIN WITH SPECTACULAR VIEWS OF BEAVER LAKE! Lovingly crafted and maintained log cabin with spectacular views of Beaver Lake! 6” log walls, wrap-around covered deck, open deck and screened porch, 500 gal buried propane tank, deck stained 10/17, house stained 2016, new roof 2015, roll up shade screens less than 1 year old, house is wired for emergency generator. Lots of room for friends and family to make memories. This beauty won’t last long!!! You’ve got to see it to believe it! #1072041. $385,000. UNMATCHED VIEWS FROM EVERY ROOM IN THE HOME! Approx 125’ of lakefront with unmatched views from almost every room in the house! Electric sunshade on back deck makes sitting outside in the summer pleasant and the wildlife will entertain year round. Master bath boasts beautifully updated walk-in shower and solar tube. Huge closets in the downstairs bedrooms. Pellet stove & pool table in basement and wood burning fireplace in upstairs living room with blower keeps the upstairs warm on cold nights. Garage holds 2 cars and a golf cart or riding mower. #1103660. $369,600. THIS PROPERTY WOULD MAKE A FANTASTIC HOBBY FARM!! grow. As lodges are completed, individual condos are being sold, primarily as 2nd homes. Owners have the option of making their condos available for nightly resort rental while they are not using them. This creates an enjoyable atmosphere, with income potential for your home away from home. Custom built home has many extra features. 4BR, 3BA, 3-car garage, partial basement, Hearth room off kitchen, upgraded countertops,formal living has 2 sided gas log fireplace & dining room for entertaining . Utility room has 1/2 BA. New roof in 2015, Ground source Heat & Air replaced in 2016. Storage shed near the ‘’Hydroponic garden’’. Pull down stairs to attic for extra storage space. Perfect for the growing family. 1BR, 1BA, FR in basement & 13x15 storage area all on almost an acre corner lot. #60122995. $289,900. Cute Victorian home in the town of Verona. Needs a little TLC, but has great details. Wood floors, high ceilings. Recently added master bedroom suite. 2 car metal garage. Great price, this one won’t last long!! #60127033. $62,900. 4BR, 3BA SpLit level home has kitchen/ dining combo that looks over living area. Lots of windows looking over in-ground pool. 2 living spaces. Master BR includes his & hers closets, garden tub, double sink, & stand-up shower. Back yard has privacy fence & outdoor fireplace, shed for extra storage stays.#60128579. $264,900. Story & 1/2 home nestled in the trees, hardwood flooring, master suite has vaulted ceilings. Solid surface counters in Kitchen. Fireplace in Living room. Partial basement has living space, utility and storage, extra room has closet but no window. Central Heat & Air, & Master brand heat source for house and water heater, water filter, 12x20 covered deck, garden spot. Oversized 40x52x14 shop. #60125012. $265,000. investors wanted!!! 20 m/l acres with hwy. frontage! Mobile home park with 35 pads, 11 mobiles convey. Great income potential! 2,300 square foot home with 500 square feet of office space, 4 bedrooms, 3.5 baths & completely remodeled in 2016. Large deck with above ground pool built in. There is also plenty of room for expansion. City water & tenants pay for all utilities. Priced to sell! #60121065. $329,900. 5BR, 4BA Home near the golf course has Formal Living (Fireplace) & Dining areas. Updated kitchen with granite counters, lots of builtin shelving through out the home. Family room has Fireplace & wet bar. Sun room for extra room to entertain. Privacy fence in back yard ,sitting areas & rose garden. Home was rewired & new roof in 2014. 2 HVAC units. Paved drive way. Lots more extras if you need room this home is for you! #60120519. $325,000. BEAUTIFUL home on 55+ acres! Custom built in 2011, this home features 4BRs, 3BAs, & over 2,600 sq ft of living space! Open concept floor plan makes the home feel extra spacious & inviting. Custom made knotty alder cabinets in kitchen & master bathroom. TONS of charm! This one of a kind home sits on a panoramic 55.62 acres where you can see for miles & miles. Large 40X55 shop building has 3 large doors, property is fenced, has 2 ponds, & is perfect for cattle or just enjoying the breathtaking views. #60121419. $379,900. Grand Home you have been waiting for! Modern Kitchen with solid surface counter top. 7-inch trim & crown molding throughout home. Master suite has a spa feel, Garden tub & stand up shower along with a private deck, 4BRs on main floor that are all oversized. Walkout basement overlooks in-ground pool, also has Fireplace, bar area, full BA, workout room & storage. Covered decks, mature trees gives shade & privacy fence. Truly a must see to appreciate. #60115243. $365,000. 53.5 acres on the edge of Monett. Marketable trees. 2 ponds, wet weather creek. Cattle tight Barbed wire cross fence for rotational grazing. catch pen to work livestock. 2 easements to the property. Map of property in office. Listing agent is owner of property. #60123412. $171,200. This home will make you proud to own your own piece of Monett’s History. 2 story block Home. 4BR,2BA, Foyer, updated kitchen, formal dining & living. Beautiful staircase & butler’s stair case, enclosed back porch & a partial unfinished basement on a corner lot. Wood private fence, garden spot. 24x49, 3 car detached garage. #60110040. $170,000. OPTIONS ARE ENDLESS for this highly visible commercial building ready for its new owner. Tile floors, all electric, new hot water heater, new heating unit, storage room, & 16-20 parking spaces. #60113824. $159,900. 15 acres on top of a hill. Beautiful location for a new home. Pond & wet weather water spring. Older well. Seller gives no guarantees. #60109966. $95,000. Great 2 bedroom, 1 bath home with hardwood floors! Perfect starter home or rental! Central heat & air. Property has detached garage & small shed. #60123464. $42,900. WITH HIGH VISIBILITY, THIS CLEAN & WELL MAINTAINED 2br, 1ba HOME on a huge corner lot with walking distance to School & Gas Station is perfect for first-time home buyers or investors. Back yard is partially fenced & includes a wood deck by the back sliding doors. Call for a showing today! #60125962. $65,000. SOLD! Wonderful updated home, ready to move in! 2-3BR, 2BA home that has lots of custom touches! New windows, paint, wall texture, flooring, lighting, interior & exterior doors, & much, much more! Master suite has an over-sized walk in closet, custom double vanity, & a large shower/tub combo. Come see the modern touches on this one level ranch style home. Spacious half acre corner lot with a nice back deck, new landscaping, and 2 car garage! Don’t miss out on this one, it wont last long! #60126186. $119,900. The best lake frontage & main channel views! Almost 6 private acres with 200’ of lake frontage. The lodge features 5,400 sq. ft., 15” Rocky Mountain Lodge Pole White Pine logs from Northern Montana, 30’ ceilings in the great room & 2-story rock fireplace, 4 bedrooms (2 master suites with private balconies), 3-1/2 baths plus media room, gourmet kitchen with Wolf range, sub zero refrigerator & two Fisher & Paykel dishwashers, & hearth room with fireplace, indoor sauna, multiple decks, 2-stall dock with swim deck just a few steps away & detached 2-stall garage/shop. Enjoy an abundance of wildlife, deer, fox, eagles, beaver & more! 5 minutes to White River trout fishing, 15 to Eureka Springs, 35 to Rogers, & 1 hour to Branson. $1,475,000 #60112070.
luxury condo with Stunning table rock lake views! furnishings included! This exquisite 3 bedroom, 4 bath, 2 level condo is pure elegance from the moment you walk in! There are so many beautiful features including acacia hardwood floors, Cathedral ceilings, kitchen with cherry wood cabinets, granite, soft close drawers & large island, 2 master suites & master baths with heated floors, large walk-in closets, 2 living areas & more! Enjoy the use of the outdoor pool, Jacuzzi & Hot Tub, fitness room & Clubhouse. Located 1 mile from Indian Point Marina & so close to Branson Entertainment! 2 parking spaces in underground garage are available for additional $$. $495,000 #60130933. Exclusive 3-Acre Lakefront Estate W/Private 2-Stall Dock! The options are endless for this 1.36 acre flat parcel off hwy. 248 box store, restaurant, etc! location! location! location! exquisite custom log-sided masterpiece on 1.21 acres in saddlebrooke! Gated Lakefront Estate on 2.5 acre Private Peninsula! Terrific Lake & Mountain Views, 2 fireplaces, many upgrades to home, large deck & sunroom, 3 car attached garage plus 2-3 car detached garage. Rustic Elegance best describes the Guest House. Park-like grounds, fountain & pond, path to the water’s edge. $895,000 #30356874 Get Back To Nature With This Secluded Lakefront Home located on table rock lake surrounded by 7.35 acres! BEAUTIFUL CUSTOM BUILT HOME SITUATED ON 3 ACRES WITH DETACHED 14X24 SHOP/GARAGE! Stunning 20-Acre Equestrian Estate in the ozarks! up to 40 acres available! Walk down to the Water! Completely remodeled 2BR + office, light & bright kitchen with quartz counters, stainless appliances, double ovens, large walk-in pantry & island, formal living & dining, hardwood floors thru-out, 2 decks, unfinished full walk-out basement is framed for 2BRs & 1BA (currently functional & sheet rocked), spotless detached shop across the street has 1/2 BA & RV hook-up. Take a look & live the lake life! $315,000 #60128625 Welcome to spectacular table rock lake bed & breakfast with 2 boat slips included! 250 lakefront acres with boat dock zoning and main channel views! Water and sewer lines as well as electric lines and fire hydrants are in. Roads are to grade. The gated and landscaped front entrance features an incredible water feature and an ornate trout fishing scene on the gate, There are also many bronze wildlife statues throughout the property! $5,900,000 #30340885 6 Commercial Office/Retail Buildings Downtown Branson! Great location on Pacific Street. shows great! $499,900 #60030736 Wonderful Hwy 76 Commercial Property! timber frame lake view home custom built by famous amish builder! beautiful country lakeview home situated on 11 acres with 2 outbuildings! WHisper Cove! luxury lakeview living in branson! Log Sided 4,000 Sq. Ft. Lakehouse! Visit Our Website To Get Your Homeâ&#x20AC;&#x2122;s Instant Value! The Ridgecrest Modified Finished Basement floor plan features 4 bedrooms, 3 1/2 bathrooms and a 2-car garage with a finished basement! This home features a galley style kitchen with a 10’ x 10’ deck off the kitchen. This home is a must see!! Conveniently located at Whispering Meadows close to Branson Landing and easy access to Hwy 65. #60112451. $168,900. 181 Ponderosa Pine Ct., Hollister. ER T D 311 Echo N Valley Cir., Reeds Spring. U RAC T N O C CONSTRUCTION HAS BEGUN! 339 Echo Valley Cir., Reeds Spring. New construction Maplewood floor plan will be completed mid April featuring 3 bedrooms, and 2 bathrooms with 1,500+ square feet finished and an unfinished basement to finish as you desire. This home has an open concept living, dining, and kitchen with an additional family room downstairs. Master suite features a trey ceiling with a ceiling fan and double vanities with a walk-in closet in the master bathroom. Both additional bedrooms on main floor have walk-in closets. Conveniently located close to all Reeds Spring Schools, recreation at Table Rock Lake with easy access to Hwy 13. #60120826. $169,900. 500 Holts Lake Drive, Branson. Construction has started!! The Thompson Modified with a finished basement 2 bedrooms, 2 bathrooms on the main floor with 2 bedrooms, a family room and a bath in the basement, 2-car garage, 1,380 square feet on the main floor and approximately 1,100 square feet to be finished in the basement, The entry leads into the living room and dining room/kitchen open floor plan. There’s also a deck out from the dining room. This home will be completed early April 2019. Colors and finishes will vary, call listing agent for details #60121812. $209,900. Lot#39, Holts Lake Drive, Branson. Option 1: The Braxton unfinished basement floor plan is a with 3 bedrooms, 2 full baths and a 2 car garage with 1,714 square feet finished. Great room & Master suite will have a pan ceiling with a ceiling fan. Laminate countertops, stainless steel sink, pantry, breakfast bar and a dining area. Master bath has double sinks, cultured marble counters tub shower combination and large walk in closet. #60121850. $224,900. Option 2: The Braxton finished basement floor plan is a with 5 bedrooms, 3 full baths and a 2 car garage with 2,714 square feet finished. #60121849. $244,900. Lot #31, Holts Lake Drive, Branson. Option 1: The Brianna 2 unfinished basement offers 3 bedrooms, 2 full baths and a 2-car garage with 1,522 square feet finished. Great room will have a vaulted ceiling with a ceiling fan. Kitchen includes an electric range, dishwasher, microwave mounted above the range and disposal. Pantry, breakfast bar and dining area. Split bedroom floor plan. #60121825. $199,900. Option 2: The Brianna 2 offers 5 bedrooms, 3 full baths and a 2-car garage with 2,522 square feet finished. Great room will have a vaulted ceiling with a ceiling fan.#60121824. $219,900. Lot #38, Holts Lake Drive, Branson. Option 1: The Groot unfinished basement offers 3 bedrooms and 2 bathrooms in 1,692 square feet finished and 1,600 sq. ft. unfinished. Includes 2-car garage. Great room will will be open to the dining room. Kitchen includes an electric range, dishwasher, microwave mounted above the range and disposal. #60121848. $269,900. Option 2: The Groot Finished basement offers 5 bedrooms, 3 bathrooms and 2-car garage in 2,692 square finished. #60121847. $289,900. 540 Holts Lake Drive, Branson. Option 1: The Katrina Unfinished basement offers 3 bedrooms, 2 full baths and a 2-car garage with 1,794 square feet finished. Great room will have a vaulted ceiling with a ceiling fan. Kitchen includes an electric range, dishwasher, microwave mounted above the range and disposal. Master suite will have a pan ceiling and a ceiling fan. #60121819. $209,900. Option 2: The Katrina finished basement offers 5 bedrooms, 3 full baths and a 2-car garage with 2,794 square feet finished. Split bedroom floor plan. #60121818. $229,900. Lot #36, Holts Lake Drive, Branson. Option 1: The Maplewood 3 offers 3 bedrooms and 2 bathrooms in 1,543 square feet finished with 2-car garage. Great room will have a vaulted ceiling with a ceiling fan. Pantry, breakfast bar and a dining area. Master suite will have a pan ceiling and a ceiling fan. #60121837. $203,900. Option 2: The Maplewood 3 offers 5 bedrooms, 3 bathrooms and 2-car garage with 2,543 square feet finished. Basement will be finished for this listing. #60121835. $221,900. Lot #27, Holts Lake Drive, Branson. Option 1: The Maplewood 3 offers 3 bedrooms and 2 bathrooms in 1,543 square feet finished with 2-car garage. Home has an open concept living, dining, and kitchen. Master suite features a tray ceiling with a ceiling fan and double vanities with a walk in closet in the master bathroom. #60121721. $199,900. Option 2: The Maplewood 3 offers 5 bedrooms, 3 bathrooms and 2-car garage with over 2300 square feet finished. Basement will be finished for this listing. #60121720. $217,900. Lot #28, Holts Lake Drive, Branson. Option 1: The Brianna 3 unfinished basement offers 3 bedrooms, 2 full baths and a 2-car garage with 1,697 square feet finished. Laminate counter tops, stainless steel sink, pantry, breakfast bar and a dining area. Master suite will have a pan ceiling and a ceiling fan. Split bedroom floor plan. #60121814. $189,900. Option 2: The Brianna 3 finished basement offers 5 bedrooms, 3 full baths and a 2 car garage with 2497 square feet finished. Master bath has double sinks, cultured marble counters tub shower combination and large walk in closet. #60121813. $207,900. 470 Holts Lake Drive, Branson. Option 1: The Hickory unfinished basement offers 3 bedrooms, 2 full baths and a 2-car garage with 1,622 square feet finished. Great room will have a vaulted ceiling with a ceiling fan. Kitchen includes an electric range, dishwasher, microwave mounted above the range and disposal. Pantry, breakfast bar and a dining area. #60121831. $224,900. Option 2: The Hickory finished basement offers 5 bedrooms, 3 full baths and a 2-car garage with 2,622 square feet finished. Master suite will have a pan ceiling and a ceiling fan. #60121830. $244,900. Now Building In Smoke Tree Hills! TBD Eric Road, Lot #4A, Kirbyville. TBD Shawn Road, Lot #46, Kirbyville. The Greenwood 1 split entry floor plan with 1,692 sq. ft. of finished square footage. 3 bedrooms, 2 bathrooms, 2 car garage and an additional family room. #60117246. $159,900. Pre-construction listing!! Southwood unfinished basement plan features 1,381 square feet of finished area with 3 bedrooms, 2 bathrooms and a 2 car garage. This home will have the master bedroom and the guest bedrooms split. It has an oversized breakfast area as well as a separate dining area. Pick your colors and finishing touches and make this home yours today!! #60117179. $187,900. 188 E. Marion Lane, Lot #38, Kirbyville. Option 1: The Brianna 2 Unfinished Basement features 3 bedrooms and 2 bathrooms in 1,522 square feet finished with a 1,522 square feet unfinished basement. Also includes a 2-car garage. $209,900. Option 2: The Brianna 2 Finished Basement offers 5 bedrooms and 3 bathrooms in 3,044 square feet finished. Additional bedrooms and a family room in the lower level. $232,900. COMPLETED! 119 E. Marion Lane, Lot #44, Kirbyville. 2514 Old Wilderness Road, Reeds Spring. You are going to love this home!! Situated on almost 7 acres of wooded property, this 3 bedroom, 3 bath home has just under 3,000 sq. ft. of living area!! Home has an attached 4-car garage and an additional shop with 1,848 sq. ft. for all your hobby and storage needs. With all the charm of a traditional home and a hobbyist dream come true. You will have room to roam and places for all your prized belongings. #60117397. $349,900. Looking to add Real Estate Professionals to our fast-growing real estate company!! Whether you are licensed or not, we will help you succeed!! • New Homes From $84,900 To Mid $300,000’s • 150+ Floor Plans Available • Endless Colors & Options Available • 10 Subdivisions In Stone & Taney Counties • Lot Sizes From 1/4 Acre To 5+ Acres! 325 Echo Valley Cir., Reeds Spring. The Thompson 2 Finished Basement offers 5 Bedrooms, 3 Baths, 2-car garage, 2,180 finished square feet. The entry leads into the living room and dining room/kitchen open floor plan. A great attribute to this home is the layout of the master suite and bedrooms being on opposites sides of the house. There’s also a deck out from the dining room. #60120833. $189,900. 245 Kallarney Road, Unit 12, Forsyth. • This land located in Rockaway Beach is currently for sale for $1,750. Tbd Jackson Lane is in the attendance area of Forsyth Elementary School, South Forsyth Middle School, and Forsyth High School. #60128226. $1,750. • Fairly Flat Corner Lot in Ridgedale. Ready for your building needs. Close to Hwy. 65. #60128224. $7,000. • Building Lot In Forsyth. Close to all downtown businesses. #60127769. $6,500. TBD Lot 2, Wolf Trail Drive, Hollister. The Oxford Split foyer floor plan features 4 bedrooms, 3 bathrooms with additional family room on lower level in 2,298 finished square footage. The great room is on main level will have a vaulted ceiling. The kitchen will have a breakfast area on one side and a dining room on the other. The master bathroom features a double bowl vanity, walk-in shower and whirlpool tub. This beautiful home will be built on over 3 acres with easy access to 65 and area attractions. #60121519. $294,900. 156 Grist Mill Road, Branson. The Arcadia floor plan features 3 bedrooms 2 bathrooms in 1,838 square feet. The kitchen has granite counter tops and stainless steel appliances. The oversized master suite has dual closets and a jetted tub. Additional features include a vaulted ceiling in the great room and a full brick front and a large covered form porch. #60110271. $234,900. Start enjoying the lake life with this incredible singlewide mobile home (14x60) which come with 16x12 shed. This fully furnished mobile home has new flooring, a walk-in shower with seat. Enjoy your morning cup of coffee on this large, covered front porch. Walk to Lake Taneycomo and put your fishing pole right in. Boat slips are also for rent. This 50-plus community offers lake front access to Lake Taneycomo and swimming pool. Lot rent is $400 per month which includes, water, sewer, trash, lawn maintenance, and all resort amenities. New amenities to come: cabana at the docks, cabana at the pool with tv, fireplace and kitchen area. Also, a playground, community room with exercise room and fenced in dog area. Great place for a second home or to retire to. #60127649. $10,900. The Southwood 2 Slab floor plan offers a modern interior and a two car side entry garage. This unique design offers three bedrooms and two bathrooms in 1,360 square feet. This home features a large master suite with trey ceiling and large walk in master closet with a double vanity in the master bathroom. The kitchen features a breakfast bar and a large pantry. Conveniently located close to Branson Landing with easy access Hwy 65. $154,900. ER T D N U RAC T N O C 2161 Acacia Club Road, Hollister. The Santa Fe floor plan offers 3 bedrooms and 2 bathrooms in a split layout. Master suite has a large walk-in closet, double vanity, and ceramic tile in the master bath. Kitchen features a modern layout with under-mount corner sink and stove, ceramic tile, and granite counter tops. Large great room with arch top doorways and a gas self venting fireplace. 2 nearly flat acres, a stone front and a two car garage. The location of this soon to be built home is close to Hwy. 65 for easy access to Branson attractions! #60110051. $249,900. 397 Spring Meadows Pkwy., Branson. New construction four bedroom, three bathroom, the Foxdale 4 Split Level floor plan has a two car garage. The first floor features an open concept living, dining, and kitchen with lots of counter space and a breakfast bar. Upstairs are four bedrooms. Master bedroom with two walk in closets. Conveniently located close to Branson Landing with easy access to Hwy 65. #60110631. $172,900. 1.1 Acre Lake View Lot. View could expand with removal of a few trees. Great location to build your Lake Home. Right House, Right Price, Right Now Branson Landing - 2019 “Boardwalk” Luxury Penthouse Condo Price Reduced! Price Reduced $50,000! 10507 s. branson Landing $399,500 MLS#60116003 2BR, 2BA, 1,907 Sq. Ft.
3 ACRES IN GOLDEN. Gently sloped with great building sites. On Farm Road 1247. $9,900. CONDO IN POINTE ROYALE GOLF RESORT. 2BR, 2BA LOCKOUT unit with a garden walk-out level patio. On the 17th & 18th Fairway. Well-equipped kitchen. Amenities galore. $77,300. COME LIVE IN THE TRANQUILITY THAT HOLIDAY ISLAND HAS TO OFFER! 3BR, 2BA home close to all the swimming, fishing & golfing you can handle! 2-car attached garage. $79,900. 172 Overton Drive, Kimberling City, MO. Quality built waterfront home in Overlook subdivision. Easy walk to available 10’x28’ boat slip. Community pool & clubhouse are a great bonus. #60113024. $385,000. 127 Wildflower Road, Kimberling City, MO. Located in popular Wildflower subdivision. Open floor plan with split bedroom. Hardwood flooring, custom cabinets & solid surface countertops. 5 bedrooms, 3 full baths. 10’x24’ boat slip available in subdivision for additional $. Adjoining vacant lot included in price. #60128389. $369,000. 510 Millbridge Trailway, Lampe, MO. MOWED TO THE WATER FRONTAGE! Cute lakefront cabin with “mowed to the water” frontage. Enjoy the great lake view from the large deck. This home sits very close to the Corp Line & the available 26’x9’6” boat slip in a private 2-stall dock! Properties like this don’t come available often at this price. MLS#60130029. $237,000. This home comes with a warning…..men, DO NOT BRING YOUR WIFE TO SEE THIS HOME UNLESS YOU ARE READY TO BUY! Breathtaking doesn’t even come close in describing the close wide open Lake View!!! Soar with the Eagles! Feels like you can reach out and touch them! Words can’t describe the quality and beauty that has been infused into this “Custom Deluxe Home”. Ready for sod & paving in March! With 3,900 sq. feet of living space and 5,900 sq. feet under roof... THIS HOUSE LIVES LARGE! Open beams, open floor plan, Beautiful Stone wall and fireplace, Gourmet Kitchen with gas stove, office/BR with hall BA, Master BR with boutique master BA and closet! Every woman’s dream! Laundry room and 3-car garage on main level. 10x28 Boat Slip Available For Addl. $30,000. PLEASE DO... “Judge this book by its cover!” Elegant 4,600 sq. ft. Cottage Style home. I would say Quaint...on Steroids! Be prepared to fall in love with this home!!! Located in the Lovely Sought after Golf Community known as Stonebridge. Gated and Secure. Club house, swimming pool, driving range and golf course...you’ll LOVE IT! The home offers 2 lots that set this home apart from the rest! Truly a “ONE OF A KIND” property! Large circle drive. “Enchanted Forest” with Fire pit and outdoor area that is stunning! Park like setting. Soaring ceilings, Hickory floors, textured walls, Gourmet Kitchen with Beautiful see thru fireplace between the living room and hearth room. Granite throughout, the kitchen offers Lovely cabinets with unique windows around counter area and a butler’s pantry, Master BR and BA on main level with guest BR with private BA also on main, laundry, dinette and formal dining. Beautiful placement of space. Lower level offers large wet bar area and family room for entertaining, 2 more BRs, each with their own BA and a beautiful outdoor patio. There are too many unique features to mention. Must See!!!! What???? Lakefront….Furnished Cabin… with a PRIVATE 2 STALL SOLAR DOCK and 2 lifts and lockers??? SERIOUSLY??? Yep!!! You heard it right! RARE FIND! Located in an Elite Kimberling City area surrounded by upper end expensive homes! This adorable cabin has 3 levels. Main level living room, kitchen, dining, Master BR with new King bed and Master BA with Washer/Dryer. Upper level offers another full BA, Queen BR and separate loft with full/twin trundle beds. Lower level offers a cozy family room with electric fireplace, BR and 3/4 BA with an outside door to your lakefront private dock. No need to buy anything! No furniture, no dishes, no appliances...not even towels or linens! It’s already there! Bring the family and friends and get started “Living the Dream”! Turnkey with up to the minute lake life style. Completely updated in 2018. Enjoy! This is a true find! Privately located on top the mountain! Remarkable home sitting high on the top of Little Joe Bald Mountain. This home has an open floor plan surrounded with floor to ceiling windows. Master BR and Master BA are located on the main level. Kitchen/Living room/Dining are all open with windows galore! Laundry and 1/2 BA to service main level. There is a beautiful waterfall off the foyer outside. Downstairs offers a large living room with beautiful vintage cabinets that serve as an office divider. Great space with large sliding door to outside. 2 more BRs and a full BA makes this home 3BRs and 3.5BAs. Very unique home with a Beautiful, large, open View of Table Rock Lake. Very well maintained and cared for. 2-car garage. A MUST SEE TO APPRECIATE AND THE EXACT LOCATION YOU HAVE BEEN LOOKING FOR!! There truly is NO PLACE LIKE HOME! Living is easy in this hard to find 4BR, 4BA, ONE level home close to everything Branson has to offer! This spacious home has been meticulously maintained and features new carpeting and tile, newer Andersen doors and windows along with dual zone heating and cooling. The private, wooded backyard is perfect for play, gardening or just relaxing on the weekend. Need a woodworking or hobby shop? This home has you covered with a heated and cooled detached garage and lofted barn. Plenty of parking for your boat, with additional hookup for Motor Home or RV. The location can’t be beat - close to schools, shopping, dining and highway access. Possible commercial property. #60127942. $269,900. Especially when the open floor plan encompasses five spacious bedrooms, three full baths, a study and a stylish kitchen that flows into the dining room. The great room and master suite walk out onto a covered deck where you can enjoy the views! Perfect for a family or as a vacation home in a community that offers tons of amenities including walking & ATV trails, swimming pools, clubhouse, fitness center and more. It will be hard to choose where to tee off with amazing golf courses by designers Woods, Fazio, Player and Crenshaw-2 open now and 2 opening in 2019. Call for your showing today. #60130400. $399,900. LAKEFRONT on Table Rock Lake. HUGE view on 3.4 acres! Open Living Concept + Endless, Lake-Facing Decks. Photos don’t do the Home justice! Nestled at the end of a Private Drive, Privacy is YOURS! Corian Kitchen Countertops, Enormous Great Room with Vaulted Ceiling & Cathedral, above the plate-line Windows. The Sliding Doors let the Lake in...Split Master Suite, Oversized Rooms, Absolutely IMMACULATE! Walk-in from the Front Drive, or Second Entrance from Lower Level Garage. #60113730. $350,000. Very close to Table Rock Lake with Boat Slips Available. Fabulous floor plan, granite kitchen countertops, stainless appliances, very distinctive electric fireplace, wood flooring in main living areas, tile in bathrooms, laundry & pantry with carpet in bedrooms. Stone veneer & covered patio. Landscaped with sprinklers. #60106654. $219,900. This is an Eye Popping 3BR, 2BA home completely remodeled in 2016 with HVAC, Andersen Low E Windows, Plumbing, Lighting Fixtures, Chef ’s Kitchen - Down to the Garbage Disposal, Carpet, Ceramic Tile, Toilets, Floor Registers, GFCI Outlets, the list goes on & on...New roof 2013 & new septic system in 2009. You can’t built this home for the price!! There is even a matching storage shed! MoArk water! Located between Hwy. 86 & Hwy. 13. #60130634. $142,900. Quality throughout this Table Rock Lake home. NEW HEATING & COOLING SYSTEM MARCH 15TH, 2019 & NEW ROOF BY MARCH 25TH, 2019. Fantastic view from enormous deck facing est for wonderful outside time without sun glare. 5BR, 3BA with 2 separate living possibilities with full kitchens on each level. 2-car attached garage on main level with heated & cooled lower 1-car garage by way of separate drive. Outstanding in-law set up! Priced right to sell. ONE OF A KIND!! HURRY! #60113730. $279,900. what a view! table rock lake welcomes you from almost every window! table rock lake view, single level, walk-in, absolutely immaculate! Single Level, Walk-in, 3 Bedrooms, 3 Bathrooms...includes an absolutely fabulous Sun Room with STUNNING Lake Views. Home sits on a double lot and runs street to street. Updates include: New Septic Tank, Water Lines, Lennox Heat Pump, SOLAR, Water Heater, Culligan Water Softener, Appliances, Granite Countertops, ALL Electric, 100 amp Service & MORE! Oversized 1-car detached garage. HOA of only $330 annually for water, garbage & street lights. Additional Lot (Lot #36) + 10’x20’ Boat Slip & 2013 18’ Sun Tracker Pontoon Boat available for additional money. TOTAL LAKE PACKAGE! This won’t last long! #60120428. $320,000. Original owner, 2BR, 2BA + Enclosed Bonus Room; heated & cooled with it’s own closet. Use as a 3rd BR, Office, Hobby Room, YOUR choice! New to newer appliances. All electric home except for gas fireplace. Open Floor Plan, Stone Fireplace in Living Room with thermostat controlled Gas Logs. Easy care yards with minimal maintenance exterior. Located in Kimberling City’s Deer Park Subdivision, a Lake Community. Golf cart riding is not required but suggested!! #60129350. $149,900. Office Phone 417.272.LAKE Carol Jones, REALTORS is now ReeceNichols Real Estate. Same Experts, New Look. • StoneBridge - 2 lots to choose from for only $4,500 each! Golf course, clubhouse, pool - all in gated community. #60114760 & #60114769....................................................................................................................................... $4.500 Each. • Crane. Corner lot ready for your new home. #60106613.............................................................................................$4,000. • Hard To Find 3.10 Acres. UNRESTRICTED, just outside of town! Less than a mile to public boat launch on the James River. Mobile homes allowed!!! #60096094...................................................................................................................$12,500. • Table Rock Lake’s Kimberling City just outside the city limits on highly sought after Joe Bald Road corridor is this nice, gently sloping homesite with community water. 12x16 workshop with electricity, air conditioning & vinyl floor! Perc test for septic already done. Just 5 minutes to shopping in Kimberling City, Table Rock Lake, boat slips...Lake life possible!!! Build your dream home on this beautiful Canyon Forest East lot. #60125618.........................................................$14,900. • 165 Ramona Lane, Kimberling City. .55 acre lot with shared well & septic. Ready for doublewide or stick-built home....................................................................................................................................................................................$15,500. 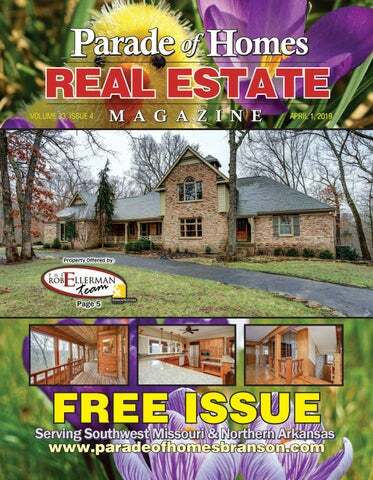 • OWN YOUR OWN PIECE OF THE OZARKS FOR YOUR FUTURE HOME! Upscale Mill Creek Shores Subdivision is where this 0.4 acre corner lot is located. Room for a circle drive & gentle slope to allow for your lakeview home! Community water & sewer keeps costs in check. Beautiful homes, waiting for yours to be built. Boat slips available. #60121960...........................................................................................................................................................................$22,000. • Need A View Of Table Rock Lake? Open & Panoramic is the view from this Virgin Bluff lot. Perfect for your lake home! #60109050...........................................................................................................................................................................$25,000. • SEPTIC & WATER is here on this lake community lot. Ready for your home, shop, house or doublewide! 16x60 concrete slab. #60121007..................................................................................................................................................$27,500. • Commercial Lot - Almost an acre on Hwy. 13, Lampe. #60085091.......................................................................$29,895. • Overlook Subdivision on Table Rock Lake. Level Building Lot with Community Sewer & Water. Boat Slip Available. #60011917...........................................................................................................................................................................$39,500. • TABLE ROCK LAKE! Outstanding hillside perfect for privacy & a view! Easement off Bus. Hwy. 13 to this 26+/- acre parcel sitting behind businesses along Bus. Hwy. 13. Endless opportunities! Private home, condos, nightly rentals??? In the County, not City. #60106605............................................................................................................................................$37,500. • Lot #6, Montego Harbor, Kimberling City. Lakefront & Lakeview plus gentle to the water!!............................................................................................................................................................................$49,900. • Prime 245’ of Hwy. 413 Frontage in Galena with City utilities at street. #60050675.......................................$125,000. THIS IS THE HOUSE YOU ARE LOOKING FOR! LOCATION, LOCATION, LAKEFRONT with a BIG LAKE VIEW! Main house has 4BRs and 4BAs. The Lighthouse (over 1,300 sq. ft.) has 2BRs, a kitchen, and 2BAs. All this on 3.15 acres. The open space from the Kitchen to the Living Room and looking out onto the Sun Room with the BIG VIEW! Fireplace in the Master BR, that you can also enjoy in the Master BA. Master BR has a view of the lake and the Lighthouse. You also have a fireplace in the Family Room and Living Room. Very nice landscaping and lots of garden space. Plus, you have a John Deere Room. Lots of Deck space. The slip is below the house and it has a concrete walkway to the dock. The 10x28 Slip is included in the price. Come and take a look at this estate! #60119830. $345,000 Remarkable, NEWLY-RENOVATED home sitting but a stone’s throw from beautiful Table Rock Lake. This home is an open floor plan surrounded with wood floor, granite, huge fireplace, exposed wood beam atop the vaulted ceiling, and GUEST HOUSE. Home includes 3BRs, 2BAs, bonus room, laundry room and 2-car garage with ample work space. Guest house includes its own kitchenette, BR, BA, living space surrounded with windows and vaulted ceiling with attached garage. House sits on nearly a 1 acre, corner lot with beautiful landscaped block walls, large back porch with sitting area and covered breezeway with beautiful knotty pine ceilings. Too many new upgrades to list! BOAT SLIP also available. #60123219. This ONE-OF-A-KIND TABLE ROCK LAKEFRONT Package offers the perfect combination of lake frontage, stunning views, & PRIVATE BOAT DOCK included just below the home. 5BR, 4BAs, 3 living areas, screened-in porch, & a beautiful outdoor FIRE PIT. OPEN FLOOR PLAN, cleared to the water’s edge. This is the lake package everyone dreams of owning! MLS#60117499. $855,000. table rock lake front/view lot! Build your lake cabin here & watch the sunset every night. Easy walk to available boat slips. MLS#60094212. $50,000. Come & enjoy TABLE ROCK LAKE! Singlewide with an add on located in a great lake-side community. 3BR, 2BA, 1,652 sq. ft. Boat Slip Available. MLS#60120162. $108,000. BOAT SLIP INCLUDED!!!! OPEN FLOOR PLAN. Light & airy. 3BR, 2.5BAs with an additional loft room that can be used as a bedroom or office. Walk-out finished basement with an additional family room. MLS#60091902. $225,000. PANORAMIC TABLE ROCK LAKE VIEW! If you’re all about the VIEW, this one’s for you! Close to the lake & designed to entertain with it’s OPEN FLOOR PLAN. This home offers main level living plus a finished walk-out basement. 3BR, 2.5BAs, bonus room, John Deere Room & 2 living areas. Boat slip available for additional $. This home won’t last long! MLS#60118184. $315,000. 70 Stone Ledge Drive, Branson West He built it in 2004! He now has updated it! Main Floor: Master, Study, 2.5 Baths, Kitchen, Dining, Laundry, and 2-Car Garage. If you’re looking for a dramatic, unique, interesting, special, light and airy home, you’ve found it! This Marlin Signature Home is all that and more! Situated on 1.6 acres of lakefront with phenomenal lake views, this home is a cut above, both in allure and quality! Located just off DD Hwy. Offered at $350,000 You feel welcomed as you enter. The open floor plan creates an ambience of simplicity and comfort. Enjoy the gas fireplace in the living room, bright and open kitchen with quartz countertops, laundry area, and dining area that opens to the deck. Splendid outside! A 70’ creek with a waterfall is just the beginning! Detached 2-car garage, or is it your shop, or is it your garden house, or is it storage for your boat when your boat isn’t in the boat slip (additional). One of a kind property! Fabulous bottom land, home, hay barn, shop, this place has it all! 25 minutes to Branson. 12 Minutes to Forsyth. Borders over 500 acres of Corp of Engineer property which encapsulates the Beaver Creek arm of Bull Shoals Lake. This unique property lays at 1.5 miles down a county maintained road from US Highway 160. Short drive to Bull Shoals Lake. This well maintained Double Wide, has adjacent apartment in separate building, 40’ x 40’ machine shed, huge 60’ x 50’ hay barn with over 13’ high side walls. Additional acreage may be available. New roof 2017, HVAC in 2008. #60124456. $289,900. This modern, amazing 5BR, 3BA, custom-built home sits on approximately 7 acres that adjoins Corps of Engineer Bull Shoals Lake property. Although located on a secluded cul-desac subdivision you will enjoy less than 5-minute access to town, boat ramps, city park, tennis & basketball courts, large playground, & fishing or boating on either Bull Shoals or Taneycomo Lakes. A short 15-minute drive will get you to the ‘’Live Music Capital of the World’’ – Branson and all it has to hold. This open floor plan design has a living room featuring a built-in inviting gas log fireplace, tray ceiling with fan, formal dining room, kitchen & breakfast nook (with a view)! The separated master BR has a tray ceiling with lighted fan, 2 walk-in closets, & an ensuite bathroom with walk-in shower. #60128768. $439,000. LARGE PRICE REDUCTION! Let your imagination go wild! This 7 acre m/l tract is located south and east of the corner of Simmons Avenue & Highway 160. Lake views and view of Powersite Dam abound! Great location for a condo project, restaurant, or other retail establishments. #60120871. $350,000. This well built modern home features an open floor plan with Cathedral Ceilings. The large master en-suite is a must see! It features a large bedroom, two large walk-in closets, jacuzzi, walk in shower and dual sinks. This private setting has lots of elbow room, with a huge back yard, 2 ponds on 5.61 acres M/L. The land is mostly cleared with fencing, a security gate is featured on the nice paved driveway. Only 10 miles to Branson Landing and all Branson has to offer. Short drive to Taneycomo or Bull Shoals lake. Walk to nice County maintained park, see photos. Mo Dept of Conservation land is close by for your enjoyment. Nice shed for tools and law mower. The bones of this house feature 2 x 6 walls, 3’ lighted concrete wall crawlspace, Advanced Septic System, Shared well. #60124820. $285,000. 19 Mobile Home sites with underground water, sewer and electric. Wonderful Views. One of the most flexible properties on the market. Make it your home, farm or income producing Mobile Home park or RV Campground or would make a Great Horse Camp property! Property boasts it’s own 20,000 gallon water tank with well, along with sewer system and underground utilities. Double wide with large 40’ x 80’ shop with office, and two large overhead doors. Over 12,000 acres of Government Wilderness is very close. Plus the property borders National Forest. A close by AT&T tower supplies awesome internet speeds. HVAC unit needs A/C repair or replacement. Two wells, two ponds. Good mix of open ground and woods. #60115563. $300,000. $259,900. Relax and enjoy life in this well-maintained Condo/ Townhouse located in a park like setting. Close to Taneycomo Lake and features a community fishing dock, salt water pool, clubhouse, walk to City owned 3 par golf course, and City Community Center. Within a few blocks you will find Branson Landing, Cox Hospital & downtown Branson! Only 2 steps into this 3 bed / 2 bath which includes a nice covered porch and is all on one level! Your covered carport leads directly to your front door. Your Condo Association provides lawn care, snow removal, trash service, exterior building maintenance, and exterior building insurance. Plenty of storage! A ramp could be easily added to facilitate entry to this Duplex style condo. #60131081. $120,000. Hunter’s Paradise with deer and turkey well established on the property. Although close to Branson lots of seclusion. Or would be a great estate property or could be developed into several tracts. This fabulous acreage has been family owned for nearly 70 years. Virtually untouched, make your dreams come true here. 10 minutes to Branson, short 5 miles to Highway 65. 6 minutes to Forsyth, the county seat. View for 20 miles plus! Approximately 2,800 feet of highway frontage. Also access to State Highway 176. Borders Missouri State Conservation Land. #60126599. $275,000. Inspected Once. Inspected Right!® Call 417.699.1394 or Visit www.ColtraneInspects.com Today to Schedule Your Inspection! •	General Home Inspections • Septic Inspections •	Pre-Listing Inspections •	Radon Testing •	Mold Testing •	Condominium/Townhouse Inspections •	Termite (Wood Destroying Organism) Inspections •	And More! Discount For Veterans, Police, Firemen & First Responders! Evening & Weekend Appointments Available. Fully Insured (GL & E&O). Residential Home Inspection & Handyman Services. Making Your House into a Home. Pet-Friendly! Quality supplies to complete your Rustic Look Kenneth Kropf 417-214-0715 1055 East Hwy. BB, Lamar, MO 64759 Mention Code 419-1 for 5% Off! spacious 2,439 sq. ft. home on kings river arm of table rock lake only minutes from Kings River Marina. Huge living room leads out to a screened-in porch, deck & fenced backyard. A formal dining room & eat-in kitchen offer room to spread out & entertain. 2 large BRs & 2 full-size BAs, tons of closet space & main floor laundry room provides storage throughout the home. LL offers a 2-car garage, utility room & workshop that walks out to patio & backyard. Beautifully landscaped & well-maintained home in an outstanding lakeside community. #60120924. $189,900. LAKE FRONT, SECLUDED, NATURAL SETTING IN A NEIGHBORHOOD. Natural streams, trails, fire pit, gazebo, tiered decks, & a large pond out the front door all on this property. This 3BR, 2.5BA home has a main floor master en-suite plus a study with a wall of built-ins, a sunroom, laundry/mud room & an open floor plan for entertaining. The walkout lower level offers room for guests as well as a hobby room with large windows on 3 sides. Outside the family room, there is a spacious deck that is included in over 2,120 sq. ft. of deck space surrounding the home. The lakeside screened-in porch & hot tub deck provides more space to spread out and relax. There’s a 2-car attached garage & plenty of additional parking space. 10x24 boat slip is available for $30,000 additional. #60110729. $289,000. SECLUDED LAKEFRONT RETREAT & A PRIVATE DOCK INCLUDED! This gorgeous setting on 2.3 acres has room to enjoy the outdoors from the front patio, multiple lakeside decks, & around the fire pit under the stars. This home has a large main floor master bedroom, updated kitchen, formal dining & living room plus a 2-car garage. The walkout basement has a family room with a wet bar, full BA, 2BR, & an office that walks out to the screened-in porch. Great outdoor space & storage with an RV Carport, additional 3-car carport, & storage sheds. This lake package won’t last long! #60121669. $425,000. CHARMING SPLIT-LEVEL HOME with 3BR, 2BA, only seconds from the lake & minutes to the boat launch. Nice home that has been updated & maintained, just a little paint to make it your own! Wet Bar on the lower level, & stone wall with flue in place ready for your wood or pellet stove. Sitting on 7 big lots with a seasonal lake view & a Beautiful, quiet setting. 2-car garage & 2-car carport, both attached. Big circle drive with this all electric home & a roof only 5 years old. Great way to get to the lake, quality for the dollar! Buyer should do own due diligence verifying all measurements, acreage & property amenities. #60128118. $179,000. CHECK OUT THIS CUTE, UPDATED 4br, 2ba HOME WITH OVER 1.75 ACRES. Room to entertain in the open design of the living room & newly remodeled kitchen. Tons of charm with concrete countertops & stone-faced island. The main floor also includes 3BRs, 2BAs & an enclosed porch that can be used as a mudroom or a place to spread out & relax. The lower walk-out level has a family room/ laundry combo, 1BR, 1-car garage/workshop, & a storage room. Close to town & lake access! A great option for first-time home buyers or new lake homeowners. Come & see today! #60121765. $144,500. CHARMING WALK TO THE WATER LAKEFRONT HOME WITH ROOM FOR EVERYONE! 4BR & 3 full BAs, main floor living & lower level family room. Vaulted ceilings in the open kitchen/living room that walks out to the large covered deck. Views of the water throughout, including the finished sunroom, & just a short walk to the shoreline or short ride to the boat slip located within the subdivision. Lower level patio for additional outdoor space, nicely landscaped property with sprinkler system & circle drive. Very well kept & maintained home ready for your personal touch! One car garage for storage or lake toys! Boat slip is available for additional funds. #60113245. $249,900. LAKEFRONT HOME SITUATED ON 2 LARGE LOTS was built with entertaining in mind, indoors, outdoors & the walkout lower level all provide wonderful spaces to entertain friends & family & now with a New Roof! Slip located directly behind the house available for only $30K creating the perfect lake home getaway. Great open floor plan, beautifully appointed kitchen, main floor master suite, lower walkout level has additional BRs & BA with a large family room/rec room. Main floor laundry is just off the kitchen & serves as a mudroom from the garage. 2-car attached garage & extra storage for all of the lake toys. Adjoining lot with additional boat slip available for $65K (ONLY available to the buyer of this home, at this time). #60105460. $355,000. CUTE & UPDATED 3br, 2ba RANCH WITH A GREAT FLOOR PLAN & IMPROVEMENTS THROUGHOUT. Sitting on 2.76 acres m/l, with abundant wildlife & only seconds from the lake. Spacious Master suite & 2 living areas, with a large laundry/storage room & a walkin kitchen pantry. Metal roof & classic stone accents on the exterior. Room to roam outside with mature hardwoods on the large park-like yard & fire pit area. Covered back porch with a peekaboo winter lake view is easily screened or enclosed. Close to the lake & boat launch in a quiet lake community. Great property for full time living or would make a great vacation lake home by the lake! #60130299. $169,000. lakefront oasis owned all the way to the water’s edge with 175’ of corps line in the lake. 5BR, 3.5BA home has main floor master, formal study & dining, spacious kitchen & vaulted great room that walks out to a relaxing lakeside patio. The grand staircase leads up to 4BRs including an office. The loft room overlooks the main floor bar/game room & family room that’ll make all of your friends envious. Gentle walk to the water & panoramic views year round. The attached 3-car garage for all the toys & a lower level storage room for the mower & extras. Over 1,300 sq. ft. of covered outdoor space, 10x28 boat slip available only a short walk away, & a boat too! Ask for details! This is the Lake Dream! #60120440. $799,000. lake front with boat slip in walking distance! Room for everyone with 4BRs plus an office, & 4BAs. The main floor boasts elegance throughout with large kitchen & morning room, beautiful master suite with huge walk-in closet & deck access wired for a spa. 2nd Master Suite in the walkout basement with secondary laundry hookups. Large family room & wet bar, multi-tiered decks & huge sunroom with heat & air. Brick & Stone Exterior in a wonderful subdivision. Boat Slip available for extra $ close by. Lots of extras for convenience with plumbed propane to the deck for the BBQ grill, auto awning & wired for a generator, & a new roof! Great vacation home or full time living at it’s best! #60129741. $325,000. BREATHTAKING LAKE & MOUNTAIN VIEWS ON ALMOST 4 ACRES WITH TONS OF SPACE IN THIS 3br, 2ba HOME. Room to entertain & spread out in the huge family room. You’ll spend most of your time in the all season room that has Windows galore, a 2nd kitchen & a wall of storage. There are great views from the dining room & the large laundry/utility room has plenty of space to spread out & work on your favorite hobby plus tons of cabinets. 25x40 workshop & Outdoor sheds have plenty of room to store the lawn mower, 4-wheelers, lake toys & more. A 10x28 boat slip available for additional funds makes this a lake package worth snagging fast. #60118503. $220,000. AWESOME LAKE FRONT BUILDING LOT THAT IS A PILOT’S LAKE DREAM COME TRUE! Build your dream home & taxi right in on the airstrip that backs up to this lakefront lot. Located on the White River Arm of Table Rock Lake & just a short drive into town for all of the conveniences & located approximately an hour drive from Branson & Eureka Springs, Arkansas, attractions. Great location, great lot, great price! #60050680. $59,000. PRIME LOCATION & VERSATILE COMMERCIAL BUILDING. Over 7,500 sq. ft. of retail & warehouse space with upper & lower level access. Warehouse with drive-in garage entrance & one of the town’s very few loading docks. Road access from front & back, ample office, showroom, storage & warehouse space. Extremely useful space for a number of industries or the ultimate hobby shop! Well-maintained property with lots of options. Only 1.5 miles from Table Rock Lake in Beautiful Shell Knob. #60044547. $175,000. THIS GREAT HWY. 86 PARCEL & BUILDING ON 2.2 ACRES OF HIGH TRAFFIC HWY. FRONTAGE located at the corner of Trace Hollow & Hwy. 86, just a short distance from Dogwood Canyon, Resorts & Kanakuk Camp. Formerly a convenience store with 4 above-ground fuel tanks in place. Concrete construction on concrete slab with well, electric, septic, & walk-in cooler. Asphalt parking & a 432 sq. ft. storage shed. Large open building with multiple uses & with additional ground located behind the building for expansion. Please note there are no financials, environmental reports or disclosures. Owners have no knowledge from former ownership. #60087097. $85,000. NESTLED AMONG THE oZARK MOUNTAINS WITHIN A SHORT DRIVE TO TABLE ROCK LAKE situated on almost 5 acres with awesome views of the lake & the mountains sits this Multiple Unit High-Rise in the heart of town close to conveniences. This 35-unit with 60+ bed capability building has multiple possibilities. In its former days it was a hotel, most recently set up for assisted living & memory care. Fully equipped commercial kitchen, lobby, manager’s quarters, office, 3 conference/dining rooms that can also serve as penthouse suites. Building could be converted to condos. Private well, swimming pool, elevator, partially furnished & both central & individual HVAC. Large shop/garage. Seller will consider owner financing WAC & agreeable terms. #60068208. $1,399,000. PRICE REDUCED!! Pristine 80-acre tract of land with Table Rock Lake & Ozark Mountain views at the heart of Shell Knob. Just minutes from the Shell Knob Bridge, lake access at the public boat launch & local amenities. Tons of wildlife in this one-of-a-kind, park-like setting with hwy. frontage & a gated entrance, rolling pasture, wooded terrain, a 4-acre Old West Village with tipis & a bunkhouse plus a historic 2-story cabin & adjacent cellar. Providing endless opportunities throughout & includes hiking & 4-wheel trails. Roads, Electric, Well & More! Located a scenic drive from area destinations such as Branson & Eureka Springs. Don’t miss this amazing chance to own this development land with countless possibilities. Also available in two separate 40-acre tracts. #60123400 & #60123401. ALL 80 ACRES - #60123399 - $676,000. TRIBESMAN RESORT boasts 63 units, 12+ acres, 5 pools, 3 hot tubs, two 20-slip boat docks, a rental fleet of golf carts, boats & more! Expansion room on existing 6 wells & multiple advanced wastewater systems. Additional unit plans in place, utility connections installed, would easily impact profits. A thriving Adventure Market resort, perfectly situated on the famous Indian Point peninsula. Only minutes from numerous outstanding local attractions including Silver Dollar City. A beautiful waterfront property on Table Rock Lake with over 800 ft. of shoreline. Numerous styles, sizes, layouts, & amenities provide a unique experience for all guests. Profitable & turn-key, includes everything needed with growth potential at your fingertips. Adjacent property is available exclusively to the buyer for extra $$. #60104412. $4,900,000. the cottage resort & market boasts 18 units, on over 2 acres, large retail store, & onsite living quarters. From one to three BR units & connectable rooms creating up to 6BRs. Kitchen & kitchenette styles, covered porches & lots of parking. Large screened pavilion & swimming pool for guests, all only seconds from the marina. A profitable resort & market on Indian Point peninsula. Only minutes from numerous outstanding local attractions including Silver Dollar City access with light traffic for your guests. A beautiful lake view property on Table Rock Lake. Individual cottages & some combinable units give you & guests options. Profitable & turn-key with improvements always in progress, includes everything you need with service expansion options available! 60127733. $849,000. this 2-story office space is 7,500+ sq. ft. equally split up & down with restrooms on both floors. Located minutes from Table Rock Lake in a busy shopping center in the heart of Shell Knob. This spacious building is wide open with endless possibilities & includes the adjacent vacant 90x100 lot. Plenty of Opportunities & room for expansion. Located in a high traffic area with good hwy. frontage & visibility. The building is currently vacant, great location for any type of business, retail or office space. Community water, sewer & parking lot managed by the building association. Arvest employees, directors, & their family members are ineligible to purchase Arvest’s bankowned properties. #60126117. $169,900. LARGE COMMERCIAL BUILDING FORMERLY USED AS A RESTAURANT, WITH HIGH VISIBILITY HWY. FRONTAGE. Large kitchen with hood system & numerous appliances still in place. Two dining rooms, server stations & 2 restrooms. Double front entrances & delivery door with ramp. Sitting on 1 acre +/- near other popular businesses. #60097988. $49,900. Perfectly Designed 253 Austin Place, Branson West, Mo. This beautiful home is perfectly designed & nestled into the Ozark Mountain natural landscape & located in a very nice subdivision. This custom built home was designed & built by a contractor for his own personal home. The home is uniquely designed with ample room for a family or adaptable for grandparents that need extra room for grandchildren. Table Rock Lake is only minutes away with the ability to have access to a boat slip when available. The clubhouse boasts a meeting room, pool, & tennis courts. All that the Branson area has to offer is close in proximity. #60118159. $339,000. 26 Edgemont Drive, Kimberling City, Mo. The perfect 3BR, 2BA home that has had the roof replaced in 2017, hot water heater replaced in 2016, & HVAC replaced in 2015. Also has its own storage room attached to the carport. Home sits on a large lot in a nice, quiet neighborhood. This is a great starter home or a perfect “flipper” for an investor. It won’t last long! #60119580. $89,900. TWO LOTS: 33 Tall Cedar Lane, Lots #11A & #14, Reeds Spring, Mo. This lot sits in a quiet community located on Table Rock Lake. Your new home or cabin could easily be built on this level lot. There is access to paved street & water is available. Boat slip (10x28) is sold with lot for $30,000. #60109354. $17,500 EACH. 857 Doc Miller Road, Blue Eye, Mo. This mobile home has 2 well-built additions with outside entrys & a gabled metal roof. One is used as a hobby room & the other can be used as a large family room or more bedrooms. The refrigerator & gas range have been replaced in the last 4 years. Owner will be leaving a gun safe that is permanently installed in the home. This property includes a metal 2-car carport, shop/garage, chicken coop, utility/storage shed & a large garden spot. #60114537. $79,000. Trout Hollow Lodge has 26 rooms featuring efficiencies, stand alone cabins, 2 and 3 bedrooms, all with WiFi, and fully equipped kitchen facilities. There is a full service marina including boats, pontoons, and 13+ slip rentals on the the 305’ dock for trout fishing. Lake Taneycomo is a ‘’cold water lake’’ with temperatures at 45 degrees year round. A great Lake nationally recognized for its size and quality of trout. This area is called the Tri-Lakes area boasting Bulls Shoals, Table Rock Lake, and Lake Taneycomo. Many guests stay at this premier Lodge and make the short drive to enjoy the warm water lakes summer recreation. This is a profitable turn key business for you & a place your guests can fish & enjoy all that the Branson area entertainment has to offer from Trout Hollow Lodge. #60118073. 22401 Tucker Hollow, Golden, Mo. This stone home has a great historical background & is adjacent to 24 acres (#60102465) sold separately by same owner. Remodeled. If you like older homes, you will love this one-of-a-kind stone home that sits on 2.56 acres. Furnishing package is available with nice antiques. Artesian well, tested, good drinking water. #60124744. $389,800. New Price. Please bring your buyers. HOA dues are $200/year for community well, 2 common wells, 10x28 slip/lift extra $$. Seller will consider any reasonable offer. This 2,800+ sq. ft. home is all on one level. 4BRs, 2.5BAs. #60105006. $299,975. 24437 Turkey Mountain Drive, Golden, Mo. This is a beautifully remodeled home. New add-on Family Room off deck 18’10”x27’4”. New HVAC Fall of 2017. Granite countertops, pull-out shelving. Custom built vanity in full hall BA. New flooring in master. Million Dollar view to west on lake. #60117165. $189,700. 24899 Fisherman’s Drive, Emerald Beach, Mo. Property sits on 4 lots with attached 2-car garage & 20x30 building plus 12x16 detached garage. 10x20 boat slip & lift for extra $$. What’s unique about this property is the fireplace is ducted throughout the whole house. 2BR, 2 full BAs, 2x6 outside walls. Whole house propane generator. #60117615. $139,000. 26745 Private Road 1255, Shell Knob, Mo. “Fixer Upper”. Sold “As-Is, WhereIs”. Has not been lived in for 3+ years. But what great potential for remodeling for part-time lake property or full-time residence. 3BR, 2 full BAs on 0.6 acre. #60106733. $74,500. 425 State Highway 265, Hollister, Mo. 18141 Cougar Lane, Eagle Rock, Mo. Vacant, Sellers Anxious. Don’t Wait... Bring Offer. This 3.6 acres is a landscaped beauty...loves labor certainly shows. The log-sided home is all on one level with open floor plan combined living, dining & kitchen. Appliances are new or new within a year. #60086492. $249,950. 2 lake front lots with well. Owner will consider financing. #60085012. $69,000. Property off Hwy. 65 & Hwy. 265, just South of Branson. #60102465. $895,000. The stone house on 2.56 acres backs up the 24 acres to the north. #60124744. $389,000. 30x40 Commercial Bldg. On Farm Road 1202, Eagle Rock Sold As Is Where Is. 0.614+/- acre. #60109890. $66,000. 4840+/- Sq. Ft. Commercial Bldg. - 126 East Church Street, Berryville, AR. Located on northeast corner of downtown square in Berryville, Sold As Is Where Is. #60129520. $199,000. Comes with restaurant equipment...make offer with or without equipment. For more details on listings go to: www.hurleylakehomes.com Call for Disclosures & Aerials. Cozy lake package including Guest home, RV Garage and workshop. 2BR, 2BA lake home with screened-in porch, newly added formal dining room updated master suite & bathroom, hot tub included! Guest home has 1BR, 1BA & an attached 2-car garage with separate road entrance. MAN CAVE? Yes there is a man cave! Complete with living space & BA! A must see with boat slip within walking distance available for an additional $25,000 with lift and locker. #60130163 $184,900. CUTE CABIN IN THE WOODS! Private, but also close to town and lake. New roof, siding, and new Enclosed deck. Nice open floor plan with a fireplace for cozy nights, and a spacious loft area with balcony. A must see. #60114916. $159,900. Honey stop the car! This beautiful brick & vinyl home is a perfect fit for your growing family. Vaulted ceilings, gas fireplace, large open kitchen with a nice eat-in area. Formal dining room, massive master bedroom with fireplace & jacuzzi tub. Quiet & private neighborhood. Across from the Cassville Golf Course, minutes from Roaring River, Table Rock Lake & town! 720 sq. ft. detached garage/shop/mancave. Please don’t hesitate or you WILL miss out! #60121816. $205,000. LAKEFRONT, LAKEVIEW, AND TRAM TO THE LAKE! Perfect for that weekend getaway or full time. 3BRs, 2BAs, each room overlooking Table Rock Lake. #60114020. $280,000. This move-in ready custom built lake home has everything you are looking for! Main level has 9 foot ceilings, master BR, large open floor plan & an enclosed game room off the kitchen. Basement has gas fireplace, oversized 2-car garage, laundry room & a SAFE ROOM! Upper level boasts large BR and a built-in bunk room to die for! Detached 32 x 22 detached garage for extra storage. All sitting on 4 lots & located just minutes from town. #60126879. $279,900. 200 ACRE RANCH WITH THREE HOUSES, surrounded by National Forest and Rock Creek runs through it. Great property for working Ranch or Hunting retreat! #60107535. $1,295,000. Cozy lake home in very private region of Shell Knob. Gentle walk down to lake. Meticulously crafted, beautiful woodwork & cabinetry. Den in finished basement can easily be used for 3rd BR. Large laundry room. Big shop, Garage. 2 walk out doors from basement rooms. Large decks. Covered Patio/grilling area. Beautifully landscaped, great neighborhood! Several new 3rd party slips available in this neighborhood! #60122293. $249,000. Amazing panoramic lake views!! Stunning one of a kind, Frank Lloyd Wright inspired home that was on the cover of 417 Magazine as a ‘’home of the year.’’ Attention was made to every detail in this home. Built for entertaining with a view...inside and out! Enter the home though beautiful cypress doors. Open floor plan with 11 ft & 14ft ceilings. Andersen windows throughout. Hand scraped bamboo floors. Master bath has heated travertine floors. Cabinets custom made by Alpine Cabinets in Marionville. Two dishwashers, icemaker, and double ovens make this the perfect home for entertaining! Boat slips just a walk away. 10x24 for $20k and 12x34 for $30k. Buyer should do own due diligence verifying all measurements, acreage and property amenities. #60129191. $599,900. LAKEFRONT HOME WITH GUEST QUARTERS!! Table Rock Lake front with beautiful views of the main channel. Original house (built in 1994) has kitchen, 2BRs and a full BA, 816 sq ft. Property also has a 30x30 building built in 2004, with 1034.8 sq. ft. of finished living space. On the lower level is a 2-car garage, a finished BR with built-in bunk beds and a 1/2 BA. Upstairs has amazing lake views with a full kitchen, BR, and full BA/laundry room. Owner has put in an elevator to carry all your lake ‘’stuff’’ so don’t worry about hauling it upstairs! Even better, house is sold with ALL furniture, golf cart and mower. 10x24 boat slip $30,000, 10x28 slip with a 10,000 lb lift $35,000. #60126273. $260,000. BUILD YOUR HOME on 2.54 beautiful acres within city limits! Land is cleared in front with mature timber in back with a slight slope for walkout if desired. New owner has the availability to hook into city water or drill their own well. Lot is at the end of a cul-de-sac. Curb with driveway cutout in place. Nice custom built homes in area. Listing agent is owner. #60126230. $37,500. Lake view ready to build on lot in Turkey Mountain Estates. Five surveyed lots that total 0.91 of an acre. Lot has a private septic system with community water and electric in place. RV carport stays (ramp does not). Boat launch close by with possibility of slip purchase from 3rd party. #60126257. $39,000. beautiful lot with table rock lake views! Sloped lot with mature trees & a golf cart ride to community dock. Get ready to build your dream lake home! 10x28 slip available for an additional $35,000. #60126452. $64,900. Nice 2.35 acre, lakefront lot on the quiet part of Table rock. Lot is sloped with mature trees. Very nice homes in area. Road is located off of 1247 between Cedar Oaks Road and Button Holler/FR 2233. Dead end road with only one other home at present. Road will be named after 2nd home is constructed. KAA Camp is 0.2 miles past road. #60126514. $70,000. Opportunity to own a piece of Monett’s history. Large commercial space. Upstairs is largely open with several rooms that are currently used for storage. Tons of potential with this space. Building could be converted to two separate spaces with lots of rental possibilities!. #60126929. $90,000. THE OLD HOMESTEAD ON BUSINESS 13 IN BRANSON WEST HAS SO MANY OPPORTUNITIES FOR A NEW BUSINESS. Lots of traffic pass by on this business road. Old wooden floors. Has a full kitchen and 2 bathrooms on the main floor already handicap accessible. Upstairs has loft areas and a full bathroom with shower. This is a must see property. #60122409. $150,000. Beautiful landscaped home located inside the city limits of Kimberling City with a short drive to the lake. Home has a year round view of Table Rock Lake. The double car garage is heated and cooled. This home has lots of great storage and lots of room. This needs to be added to your must see homes. #60127637. $199,750. Located inside the city limits of Kimberling City. Close to grocery store and other stores located in Kimberling City. Has a year round lake view from the living room. Great workshop located in the basement. #60122392. $119,000. This is a place you should definitely consider when looking to build on Table Rock Lake. Lot 49 is a vacant lot ready to build on located in a subdivision with nice homes. Community water and sewer already available for hookup. Lot has a very gentle slop. Has a 10 x 24 boat slip available for purchase for additional money. #60127153. $32,500. Level lot. Great building site in a nice neighborhood. Located inside the city limits of Kimberling City. Close to Port of Kimberling and grocery store. All the entertainment that Branson has to offer is just a short drive away. #60122023. $10,000. These two lots are ready for your new home. Located within the city limits of Kimberling City. Close distance to lake fun, grocery store, and other stores. #60104510. $28,500. Year Round Lakeview with Fantastic Fall/ Winter Lake View from this 1.84 acre ridge top lot surrounded by very nice homes! Build your estate home here!! #30351252. $30,000. This lot is on the ‘’quiet side’’ of Table Rock Lake. Subdivision has nice homes in it and is gated. Boat slip is included in the price. Subdivision has community water and sewer available to the lot. Winter view of Table Rock lake. This lot is just waiting for you to build your permanent home or a lake retreat. #60110211. $65,000. Wildlife acreage for hunting, or just to build your dream home with a view of Aunts creek on beautiful Table Rock lake. Hills and hollers with steep and gentle slopes. Great acreage with area to build and not be on top of your neighbors. Nearby lake access and access to grocery stores, schools, and all the entertainment that Branson has to offer. #60106208. $95,900. APPROXIMATELY 1/4 ACRE WOODED LOT THAT WOULD BE PERFECT FOR YOUR DREAM HOME! Great, private neighborhood with covenants & restrictions to protect your property. Easy access to Hwy. 39. Buyers need to do their own due diligence for lot boundaries & utilities. Price Reduced to $15,000. Contact Linda Trotter at 785-766-7116 for more information. Location, Location, Location!!! Lake front home with a gentle walk to the water and amazing lake views. This 4 bedroom, 3 bath home is also one of the few homes in the area that is not restricted by covenants yet surrounded by neighbors who are. Yes, that means nightly rentals may be an option. Featuring three different areas for relaxing and entertaining lakefront including an open air patio, screened and enclosed porch, and a climate controlled sun room off the master. This is the set up that everyone is looking for. Come check it out today! 24’ boat slip directly below home available for additional $25K. #60120860. $359,900. This is the LAST lake front lot in Rock Creek. It boasts excellent views and a building potential you just don’t find anymore. Located in a small community on the quiet side of Table Rock Lake only 30 min from dining and shopping in eclectic Eureka Springs. By water, located between Big M Marina and Eagle Rock Marina on the White River branch of Table Rock Lake. Only available because current owners for the last 30 years are tired of mowing! Boat slip available in community from 3rd party. #60119216. $65,000. Price just REDUCED!! Welcome to 27319 Hickory Drive and your new lake retreat. Finding a property with a boat slip available in Chain O Lakes is a challenge on its own. Toss in a 30x40 heated outbuilding for all your lake toys and projects. Couple that with a single family ranch on 3 flat lots and room for RV parking. Yes, this might just be the perfect lake property. Located just minutes from Eureka Springs, Roaring River state park, and Mark Twain national forest. Within an hour of Branson Mo. and Rogers Ark. Summer time or year round, this is the place to be! Boat slip is additional $20k. #60117221. $152,900. This is a heavily wooded lake front lot. From the road, this property is not breathtaking at all. You might actually want to just drive on by. However, when you are approaching by boat, you can see all of the potential of this property. You can walk down rock shelves to the waters edge and you should have a spectacular view after a little bit of tree clearing. #60120915. $44,900. Country living at its finest. This 3 bedroom beauty is situated on 7.3 acres of flat land that is neighbored by 2 large estates. Entire property is fenced. With pond and mature trees, this is a horse lovers dream. Generac whole house generator. 2 car attached with 1 car detached garage. Hardwood floors, cement siding, metal roof, and a great location just a mile from Table Rock Lake. Don’t delay, CALL TODAY! #60106661. $169,900. It’s Party Time people!! This 5 bedroom, 3 bath home has been a CASH COW for the current owners turning in over $20K per year as a part time vacation rental. Sitting on 5 acres and with no covenants and no neighbors in sight, this custom built home was made for the entertainer. It boasts a beautiful in ground pool with slide, hot tub, covered stage, pool house, fire pit, and patios and decks galore. Detached garage for all the toys. Call today, it’s time to play... #60109126. $325,000. Are You Looking For A “Private Office” For Your Real Estate Career? GREAT STARTER RETIREMENT - OR VACATION HOME. Situated on a large fenced yard with room to roam located in a quiet neighborhood. Recently remodeled. $59,900. Give Jim a call. 417.230.2520. ONE-OF-A-KIND, FANTASTIC QUALITY BUILD LAKE VIEW HOME. Hilltop Lake Views from practically every room in the home. #60127383. $580,000. Give Jim a call. 417.230.2520. A MUST SEE!!! Enjoy the fantastic Lake Views of Table Rock Lake from all levels of your home. Huge covered deck to enjoy the Ozarks evenings or entertaining. $495,000. Give Jim a call. 417.230.2520. For A Confidential Interview, Contact Jim Stockton at 417-230-2520. 9+ M/L ACRES IN THIS ELITE SUBDIVISION. $140,000. Give Dustin a call. 417.294.7916. 7+ BEAUTIFUL ACRES WITH A WINTER LAKE VIEW. $125,000. Give Dustin a call. 417.294.7916. 8+ ACRES LOCATED IN ONE OF THE QUIETEST & MOST BEAUTIFUL SUBDIVISIONS ON TABLE ROCK LAKE. $85,000. Give Dustin a call. 417.294.7916. Call Karla Pankovits to List, Buy & Sell! LISTING INVENTORY IS LOW & I’M READY FOR YOURS! COMFORTABLE ELEGANCE! Custom 5BR, 3BA home on over an acre. Gather the family in the large great room with a bar on the upper level & then retreat to the covered deck or secluded back yard overlooking a relaxing creek. $419,900. TRANQUIL SANCTUARY! 2BR, 2BA Ranch Home on over an acre with lots of extras. Plant lovers will be thrilled with the indoor, in-ground sprinkler system. Doggy door to back deck & fenced-in yard with gorgeous landscaping. One of a kind! $324,900. ACREAGE IN KISSEE MILLS 2945 slough hollow road, kissee mills, MO. PERFECT PROPERTY FOR HORSES! A charming farmhouse, multiple barns, & workshop all reside on this sprawling 82.5 acre property close to Bull Shoals Lake! Natural stone work appears throughout the 3BR, 1.5BA home. $297,500. PRISTINE 2BR, 2BA “WALK-IN UNIT WITH A COVERED DECK & STORAGE ONLY STEPS FROM LAKE TANEYCOMO! Desirable Taneycomo Terrace location has 3 community pools, exercise room & fishing dock with boat launch. $119,900. • Lot 107, Seven Pines Drive, Saddlebrooke, MO. Peaceful surroundings make this a perfect place to build! Located in an upscale gated section. $45,000. • 149 Appaloosa Trail, Saddlebrooke, MO. Great lot site that backs up to trees! No one can build behind you! $35,000. WOODED LOT IN FIRECLIFF MANOR ESTATES, close to schools & Lake Taneycomo. $10,000. eASY aCCESS tO bRANSON 8669 hISTORIC hWY. 165, hOLLISTER, mo. 8 Lake Forest Drive, Galena, MO. 245 kALLARNEY rOAD, fORSYTH, mo. INCOME OPPORTUNITY! Main home & five 1BR rentals that rent weekly for $150 or monthly for $500. The main ranch-style home sits on just over an acre with large dining room, family room & master BR. 2-car detached garage with addition included. $325,000. COMPLETELY FURNISHED 2BR, 1BA, singlewide on 5 acres! Perfect for that weekend getaway or permanent living! Large deck! $69,000. FURNISHED 3BR, 2BA HOME ON LAKE TANEYCOMO! Walk to the dock for the best fishing on the lake! Community offers pool, lawn care, & more! $25,000. Kings River Landing - A New luxury residential development on the pristine kings river. Unparalleled experience of breathtaking, natural beauty and a quality of life unsurpassed. Choose your parcel with all the natural splendor you desire, and start building your dream home canoeing and swimming with family and friends in the clean, crystal clear, cool water of Kings River. All land owners will have unfettered access to a sandy community beach. Acreages start at 4 acres up to 110 acres and are a combination of riverfront, views, creek and nature’s landscaping; with parcels starting at $135,000. Call Robin. 870-480-3939. 10 ACRES FOR SALE located on Hwy. 62 approx. 4 miles east of downtown Eureka Springs, AR. HIGH TRAFFIC AREA w/approx. 400 ft. of Hwy. frontage. 832 sq. ft. cabin or retail space, 32x40 metal shop building. Private well and septic on site. $189,000. 240 acre farm/hunting land near eureka springs, Ar. Near Beaver Lake. Long Ridge with multiple home sites running over 1 mile from one paved county road to the next country road. Abandoned farm house with Spring fed water and Spring house and electric. Mature timber, walnut, oak and pine. Deer and turkey hunting, garden site. $499,500. LOCATED ON THE TROUT WATERS OF WHITE RIVER IN NORTHWEST ARKANSAS IS 18.75 ACRES FOR SALE. Wooded and gently sloping with nice trail to the over 1,000 ft. on the White River shoreline. Unrestricted land, big views of the White River, bluffs and rock features. Property is located just off Hwy. 62 West of Eureka Springs and approx. 25 minutes to Rogers or Bentonville. $349,000. 575 Acre Ranch For Sale In Northwest Arkansas. Located on a Mountaintop in the Ozark Mountains is a Very Private and Secluded 575 acre Ranch/Recreational hideout with BIG VIEWS! Self Sufficient living with 3 year-round springs, 2 Spring fed fishing lakes, 12 ponds, Deer and Turkey Hunting, gun range, ATV trails throughout land, 3,800 sq. ft. Barn. Property has been a Cattle Ranch and is Fenced and Cross Fenced. END OF THE ROAD privacy. This is a property you can survive living on comfortably during troubled times. 2 HOMES on the property, both of which are well cared for and in move-in ready condition. Call Robin for Maps and more info. 870.480.3939. $1,575,000. to a mountain top, creek, timber, pasture, edge of Eureka Springs. $315,000. • 20 acres with 2 homes, shop, garage , bluff, caves, War Eagle River frontage. 1 mile to Hwy. 412 near Fayetteville/Springdale. $449,000. • 130 acres. Spring fed fishing pond, mountain top views, Many building sites, timber, joins Paved road on the edge of Eureka Springs, AR. $514,500. this is a great home selling below market value, immediate possession! Central vac, wet bar with ice maker, lots of glass-face cabinets, vinyl blinds, large shades in solarium with floor length glass. Over 100 trees. 12â&#x20AC;&#x2122; ceiling, crown molding, multiply heat & ac, appliances, large sunroom, garden tub, & gas log FP. 6 lots & home in city. Backs 3 county lots. Turf lawn sprinkler system, private well for sprinkler, 3 nice BRs with large walk-in closets, large utility with BA, 3 bay garage with lockers storage across back, fenced patio sitting area off home & garage. Large walk under storage room, food island, pantry, & many cabinets. Some newer flooring. take a look at this all brick ranch! Stately, yet understated, this 3 bed, 2 1/2 bath, single level home resides in an established residential area. All City Utilities, Central Gas Heat & Central Electric Air. Brick Fireplace & Mantle converted to Gas for back up heat. Large Family room, off the Entry, in the front of the house is backed by a nice sized Kitchen with Breakfast Bar & Cozy Living Room area around the Fireplace. The Bedrooms are generously sized, & the Master Suite is suited to the type, & Vintage, of the Construction. Mild updates may be desired, but not required. This is a great opportunity to purchase over 2,000 sq. ft. finished for a very reasonable price. Come take a look! FOR SALE BY OWNER 140 Elmwood Court, Forsyth $325,000. Happy To Work With A Buyerâ&#x20AC;&#x2122;s Agent! French Traditional custom, all brick, 3 car garage, extraordinary finish detail, 5BR, 3 full and two 1/2 baths. UPSTAIRS has oak hardwood floors, gorgeous crown molding, see-thru fireplace, powder room, laundry, kitchen open to breakfast room and hearth room, formal dining room, living room, 3BRs: master with jetted tub, shower and fireplace, mini-master with full bath, and a guest room. LOWER LEVEL features separate drive with private entrance, stained concrete floors, solid wood doors and trim, large living area with kitchenette, 2BRs, full bath, 1/2 bath, game room/craft room, spare room and John Deere room. Approximately 5,000 sq. ft. New roof 2018. On cul-de-sac in quiet neighborhood. Just 20 minutes to all that Branson has to offer! Would consider trade for house and/or land in Arkansas. looking to buy? We Would Love To Help You Find The Home Of Your Dreams! $1,600,000! 370-acre farm with 3BR, 2BA Ranch Style Home & several amenities in McDonald County. Newer copper metal roof, multiple heat sources, rural water, & attached garage. Bonus room. Large stone barn with loft, barn with slab & roll-up door, steel corral with loading area, multiple springs & ponds for livestock, plus several hunting stands & a guest camper. Land is cleared/timber combo with pasture for grazing & hay, & good timber in wooded areas. Just minutes to AR! Call TEAM THOMAS. #60119144. Great Opportunity! Cute 2BR, 1BA, recently remodeled home in Wheaton. Spacious bedrooms, formal dining room, cellar, 1-car carport & a studio apartment in back! Call TEAM THOMAS. #60117857. Remodeled 3BR, 2BA Doublewide with in-ground pool on large lot in Granby! Home features spacious BRs, large master BA with jetted garden tub, fireplace in living room, open kitchen/dining area, new flooring, fresh paint throughout, new steel skirting, & new decks. Detached garage with chain link fencing for the backyard. This is a must-see! Call TEAM THOMAS. #60125137. Office Building in downtown Neosho! Building sits next to beautiful Big Spring Park & is conveniently located in downtown area near courthouse, post office, & other businesses & amenities! Building features dual HVAC systems & could be divided into 2 sides for multiple tenants. Call TEAM THOMAS. #60128152. 3BR, 1BA home in Monett with fenced back yard & covered front porch, finished basement, lots of potential. Home currently used as a rental. Call TEAM THOMAS. #60101021. 10 mostly cleared and rolling acres near Highway 60 between Granby and Monett! This could be a beautiful and secluded location to build your dream home, to run some livestock, or hunt. Shoal Creek flows nearby, too. This is very nice country acreage! Call TEAM THOMAS. #60130602. 2BR, 2BA, totally remodeled home on large corner lot in Granby. Detached 1-car garage/workshop, newer metal roof, central h/a, unfin. bsmt., fenced-in side patio, lots of updates. Formal dining area & breakfast nook could be 3rd BR. Call TEAM THOMAS. #60110703. Beautiful Country Setting with 2 homes on almost 20 acres between Wheaton & Rocky Comfort! Traditional 3BR, 1BA home features beautiful cabinets in the kitchen, plenty of storage, & large BRs. Doublewide is 3BR, 2BA, 2006 model. Older barn, newer large metal barn, plus an old Poultry Barn. Offered without DW for $160,000. Call TEAM THOMAS. #60127256. 3BR home on corner lot. Fenced back yard, huge oversized garage with office space that is heated & cooled. Mature trees. One-owner home. Call CHARRI GARY. #60107472. Large 6BR, 3BA living area on nearly 20 acres south of Rocky Comfort! Large living areas that are ready for your finishing touch. Several outbuildings (2 of them are newer & spacious) for livestock, workshop, or storage. All this with large pasture, pond & country seclusion! Call TEAM THOMAS. #60128027. 6BR, 2.5BA Home on huge corner lot in Granby, sits on just under an acre, unfinished basement, beautiful setting, 1-car detached garage/workshop. Recently remodeled inside & out into a gorgeous masterpiece. Screened in side porch & awesome back patio area. Call TEAM THOMAS. #60114551. Commercial Bldg. on Main Street in Granby with tons of potential! It has been a restaurant, with potential living quarters on the 2nd floor. Mostly gutted & ready for itâ&#x20AC;&#x2122;s next page in history. Great downtown location! Call TEAM THOMAS. #60131662. Name:____________________________________________ Address:___________________________________________ City/State/Zip:______________________________________ Email:____________________________________________ Phone:____________________________________________ Credit Card: q q q Credit Card #:______________________________________ Expiration Date:____________________________________ 3 Digit Code On Back:_______________________________ Name On Card:_____________________________________ Make Checks payable to: POH, LLC Please allow 4-6 weeks for delivery of your first subscription. Greenwood Split Level Virtual Tour! 4055 East Hwy. 76, Kirbyville, MO 65679 • 417-544-0850 3833 North Hwy. 65, Harrison, AR 72601 • 870-416-3220 riley u-bsmt. Follow us to see homes being constructed that are for sale, available home plans, as well as new virtual reality tours! Want to get those projects completed but don’t know where to start? We have a Designer to help! You can see your Kitchen or Bathroom renovations in 3D before you order! Cabinets, Flooring, Appliances & more! Now offering: Beau Flor, Bostik, Corian, Evoke, Floridatile, Kaycan Siding and Shutters, Kenroy, Koch Cabinets, Mapei, Mohawk Flooring, Saco Cabinets, Soci Tile, Timeless Designs Carpet and Flooring, Triangle Brick, Verasatrim, and Whirlpool Appliances. YOU CAN IMAGINE IN LODGE AND CABIN DECOR! Hand-Crafted Furniture, Taxidermy, Wall Decor & More Made By American Craftsmen! The amount of your monthly mortgage payment will depend on how much you borrow, the term (repayment period) of the loan, and the interest rate. If you know how much you need to borrow and what the interest rate will be, you can use this chart to find what your monthly principal and interest payment may be for a standard 15-year or 30-year fixed-rate mortgage. Luxury Flooring at a reasonable price. Financing Available. Wide Selection. Quality Installation. In-Depth Consultation. HOME - TERMITE COMMERCIAL We Inspect All Major Components Of The Home. Check Out Our Reviews On Google! REALTOR® Office: 417.334.1892 Mobile: 417.335.0352 500 West Main, Suite 101 Call Anytime! Branson, Missouri 65616 Joni@GerkenandAssociates.com Licensed Over 30 Years Thinking of buying OR selling, please call me. I really do work 7 days a week! WOW is inadequate to describe this beauty! 3.5 acres of LAKEFRONT & I’m not kidding! 586 feet of shoreline. 2 master BRs, 3BAs, office, formal dining, open floor plan. Woodburning stove affords ambiance. Electric fireplace in family room too. Lots of decking & a 2-car oversized attached garage. Newly planted fruit trees plus grapevines & blueberry bushes. Nice addl. 1,800 ft. of basement/crawl space with BA but unfinished. Priced at $225,000 with all appliances except washer & dryer. Short walk or golf cart ride to the lakefront to enjoy swimming, boating, fishing – just doesn’t get any better. #60131323. MOTIVATED SELLER- HOME WARRANTY INCLUDED. Owner has moved out of state and needs to sell this wonderful home. Great layout with a master BR on each level. Formal dining, wrap-around decking and another great deck off the back with privacy fence. Home boasts central vacuum and it’s wired for an emergency generator. Huge pantry and walk-in closets. Home is located in Clear Water Acres subdivision - one of the premiere areas on the south side of the lake. Shows pride of ownership throughout. 15 minutes to Bass Pro’s Big Cedar Lodge and 20 minutes to downtown Branson. Shopping and music shows galore!! You’ve got to see this one. All upgraded appliances stay and home is immaculate. Call me anytime for a showing. I live around the corner and I do work 7 days a week!! $232,500. #60116047. I NEED YOUR LISTING! I'VE GOT MOST OF MINE SOLD! I have 27 years experience with Gerken and Associates and know the area better than most. I really do work 7 days a week! An opportunity for an astute buyer. This parcel sits on 2.1 acres of one of the highest peaks in Taney County. The Property overlooks the Chateau, Table Rock dam and includes a partial lake view. The 4-plex stays rented with cash flows of $2,000 per month. Property has a private well and septic system. All units are 1BR, 1BA. All have appliances except for washer/dryers. $160,000. #60111219. WOW! A rare business opportunity like this does not come along often! Busy convenience store located just blocks away from the nationally recognized Silver Dollar City which attracts millions of visitors a year. Next to full service marina and campground. Living quarters located above the store and features 3BRs, 2BAs AND a fireplace! You must see this property. Zip line and additional property available however for $700,000 you get the ‘’Deer Run C-Store’’ and living quarters. You won’t believe the traffic this mom and pop operation generates. You have a captive audience and a very lucrative business. Year round operation! $689,000. #60106664.
. . . y r a n i d r o a r Ext Pristine, Majestic, Magical... If these are the words that describe your next investment, look no further than The Rusty Moose! Panoramic views from every room and magical sunsets overlooking Table Rock Lake. Your guests will get lost in this extraordinary property! Walk into the great room and take in the 30ft window view of Table Rock Lake or step out onto the balcony and feel the quiet breeze. Grand stone and log fireplace, open kitchen with handmade custom hammered copper sink, 20ft dining room table with Windsor chairs, 8 king master suites, large walk-in tiled shower, Jack-n-Jill bath, Juliet balcony, Bose surround sound system, Foosball table, pool table! Minutes from Port of Kimberling Marina. #60108120. $860,000. Truly one of Table Rock Lakeâ&#x20AC;&#x2122;s most breathtaking experiences! D AVE D OVE Here For All Your Real Estate Needs!